I’m always on the lookout for hidden gems that for whatever reason don’t get the attention they deserve. Particularly when they’re a stone’s throw from touristy spots and make an easy add-on to a trip (see: Trebinje, a pretty, untouristed ethnic Serbian town an hour bus ride from Dubrovnik, or Apricale, a gorgeous Italian hill town a stone’s throw from the French Riveria). Typically I hunt for these places on Google Earth. Well, I found what looked like an awesome one! Ixcateopan de Cuauhtémoc is this amazing little town with white cobbled streets, an archaeological site, colonial architecture, and is supposedly the final resting place of the last Aztec Emporer, Cuauhtémoc, just a half-hour from (quasi-)touristy Taxco. Sounds pretty amazing, right? Well, the owner of my hotel unfortunately advised that the road to Ixcateopan isn’t safe due to the drug war. Damn. But, just a few miles down the road towards Ixcateopan I found something else that looks pretty cool–a great big waterfall! And one that doesn’t even warrant a mention in the Lonely Planet. I decided to ask around and check it out. The view out the front window of my (VW Bug) taxi to the falls. It’s about a ten minute drive down the road towards Ixcateopan (…a road which, for posterity, has numerous minibuses buzzing in either direction, and which the cabbie scoffed heartily at being too dangerous to travel; oh well, maybe next time!). We eventually pulled up to the waterfall. There’s a little swimming hole, a little shop, and some locals and Mexican tourists hanging out. This was a tiny, disappointing waterfall, to be brutally honest. 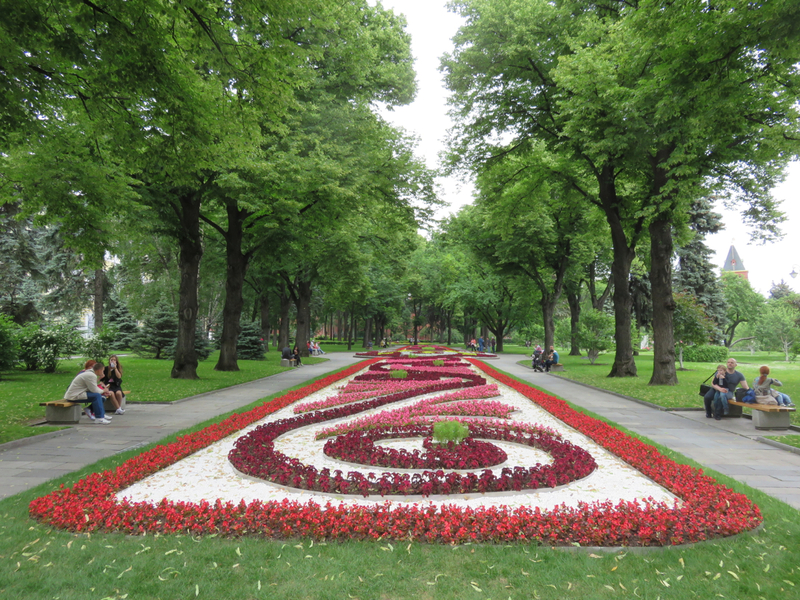 A local curiosity and pleasant place to bring your family, but not a really noteworthy place. This was also not what I was after. I said I was looking for a big waterfall, way up the mountain! I even walked out onto the highway and pointed up at the waterfall for emphasis. “Oh…you want that waterfall. Well, that’s a thirty minute hike up the side of the mountain, if you want to see that.” Um, of course that’s what I wanted to see! I hired a local kid as guide to show me the way up the completely unsignposted, but satisfyingly dog-filled, hike. A mural of the town the hike starts from. It even has a tiny waterfall in the upper left hand corner! My guide stops to take in the mountains of Guerrero. The trail eventually goes by an unfinished church. It’s apparently called Cascada Cacalotenango. It must be several hundred feet tall, and for travelers who, well, enjoy waterfalls, is definitely worth the couple hours’ excursion from Taxco. In fact, it would be even better as stop on the trip back from Ixcateopan–now that would be the perfect day trip! Years ago, we covered a hidden gem in Mexico: the incredible silver mining city of Guanajuato. Since then, Guanajuato has gotten a fair amount of international cred: I’ve seen it pop up on lists of travel destinations, and it seems like people finally are acknowledging the town an hour from the famous San Miguel de Allende is very much worth a visit. It’s even got a nonstop flight from Atlanta now! Well, down in the State of Guerrero in Southern Mexico is another epic silver mining town: Taxco. Taxco is a considerably hillier town, and probably even more filled with stunning vistas than Guanajuato. Guanajuato’s center sits in the relatively flat bottom of a deep ravine; Taxco was crudely built on the side of a mountain. This town is the land of the Stairmaster. There’s barely a flat spot anywhere! Unlike Guanajuato, whose heyday was during the colonial era, Taxco grew well after Mexico’s independence, during the late 1800s. 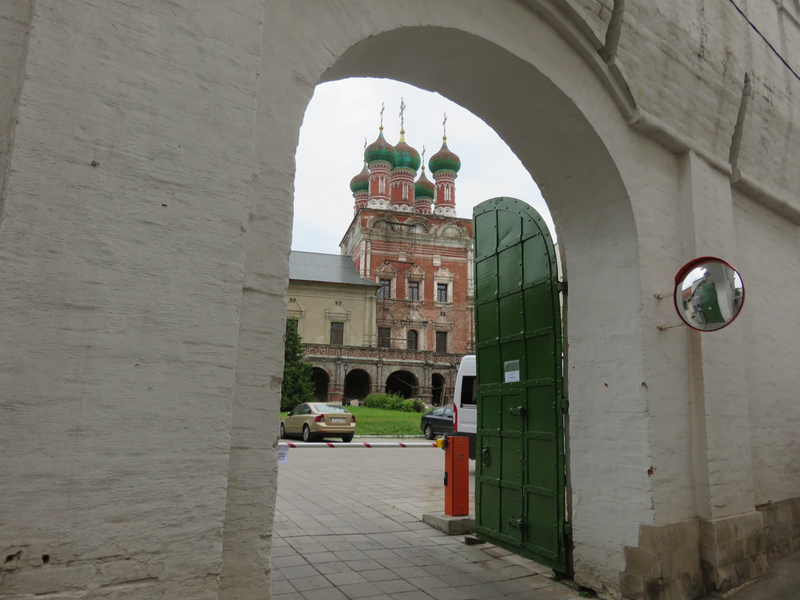 The streets are quaint, but have less grand architecture that looks straight out of Europe. Instead, there’s a greater feeling of closeness and intimacy here. Instead of gelato stands and student-run art shops in Guanajuato, Taxco has dog-filled alleyways aplenty! A very short stroll from the central square and you’re wandering in typical Mexico. The city definitely feels less refined and prosperous than Guanajuato. Guerrero’s per capita income is about two-thirds of Guanajuato’s. Moreover, tourism has taken a huge hit from the drug war, which has, sadly, engulfed Guerrero as much as it has anywhere in Mexico. I wish I could say that Taxco is outside of the fray–heck, maybe it is!–but the city of Iguala, which in 2014 became synonymous with the busload of Mexican activist students who were murdered by corrupt politicians in cahoots with the drug cartels, is worryingly near. Consequently, Gringo tourists are a rare sight; most of the visitors are Mexican. …and, best of all, ample terraces for breakfast, coffee, lunch, more coffee, dinner, dessert, or a drink! 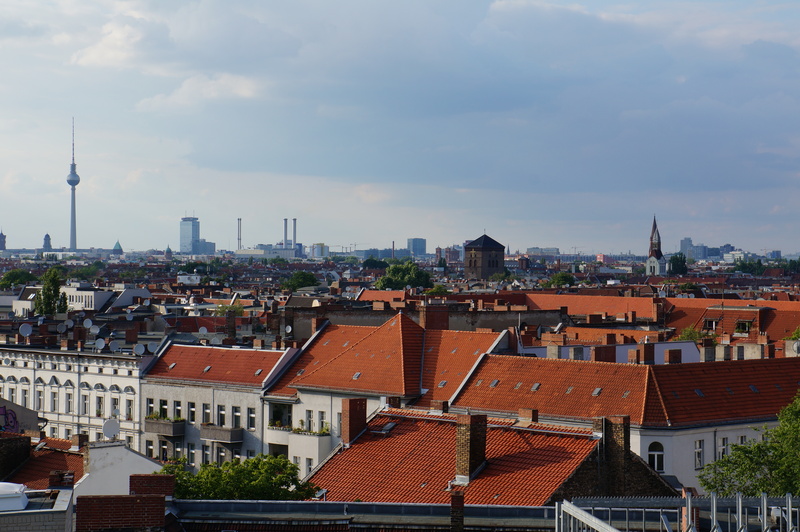 Each with an amazing, unique view over the old town. 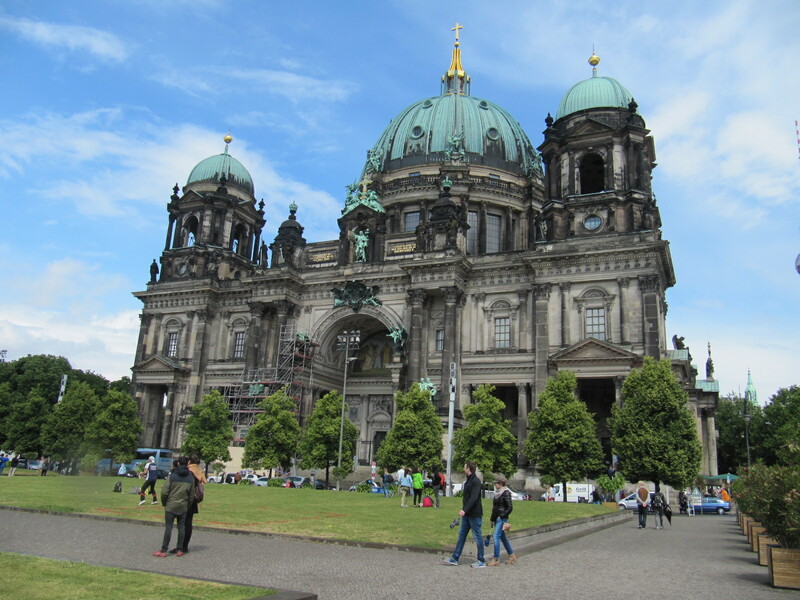 And yes, the cathedral! One of Mexico’s most distinctive and impressive buildings. 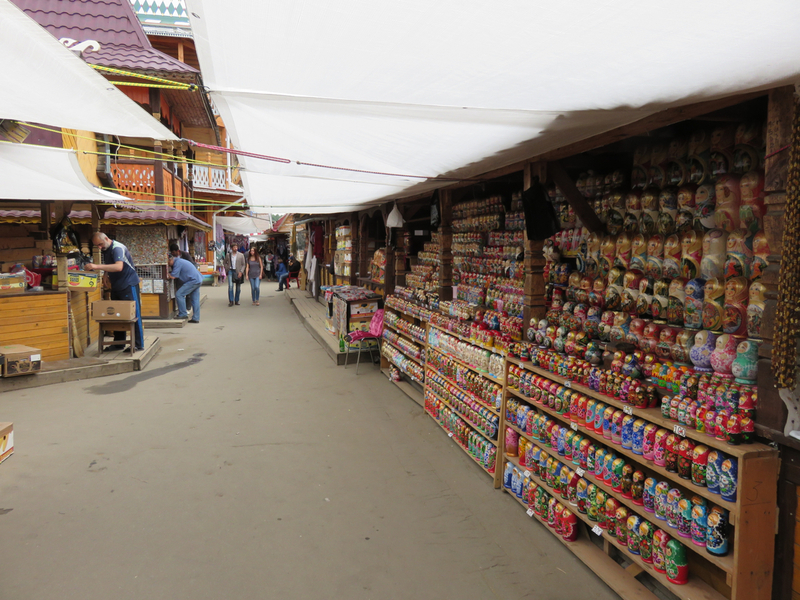 Taxco also has a sprawling market district–or market districts. No respite from the stairs, I’m afraid! The locals’ part of the market, probably the most interesting area for gringo tourists to wander in and grab a bite of street food. …alongside some more, er, colorful wares! Of more interest to Mexican tourists is the seemingly endless silver market. It’s certainly a grittier destination than Guanajuato, but Taxco doesn’t disappoint. It’s just a two-hour bus ride from Mexico City, so Taxco is definitely worth a visit if you’re nearby, and should be a high on the list for any foreigner who wants to get to know Mexico a little better. Shortly after the trip to Zion, and after a work trip to Vegas, I was off to Tucson to visit my mom and stepfather, who were holed up there for the winter. First stop on the drive: the Hoover Dam. And, thanks to my characteristic lollygagging in Vegas, I was rewarded with pretty amazing light! So I figured it was worth a quick post. The clocks on either side of the Colorado, bringing order to one of the most confusing time zone borders in the US. In the summer, they show the same time; in winter, Arizona is an hour ahead (and making it clear my six hour drive to Tucson was going to be mostly in the dark!). Lake Mead sits roughly 150′ below full pool, thanks to drought conditions and, more importantly, overuse of the Colorado River’s water. Sadly, the river only reaches the Gulf of California once in a blue moon–once in many blue moons, to be precise. The Art Deco architecture is definitely one of the things that makes this a really cool stop! With serious picture-perfect winter weather in Zion, Molly and I got out and squeezed every bit of daylight we could out of the Park. And the place was ripe for exploration, even on a tight time frame, because in winter cars can drive all through the place! So thus follow some shots of what an awesome place to visit Zion NP is, even if you opt for a less strenuous introduction than barreling up to Angel’s Landing (which, in fairness, appears to be exactly what most tourists do). Seriously, this is my new favorite National Park. Awe-inspiring landscapes throughout, especially with the unexpected contrast of red rocks and perfect white snow. For a less-demanding way to stretch out your legs (although this trail is listed as MODERATE, in the interest of full disclosure), the Canyon Overlook Trail is a great option. …to an amply rewarding lookout! In the distance, the West Temple (on the left) and the Altar of Sacrifice (on the right). An amazing, forbidding sight, especially generously heaped with snow. A little like how I picture Cerro Torre to look (sadly, a place I have no link for at this stage in my life–someday I’ll correct this). And now knowing the names of the mountains makes it all the more forbidding! Although we had to rush back to Vegas that evening to meet with my dad, Molly and I couldn’t resist one more possibly ill-advised major trek: this time to Observation Point, a somewhat daunting 8-mile round trip hike with a supposedly perfect overlook at the end. A much longer hike than Angel’s Landing, although less risky in snow. We had to start early to keep on schedule. 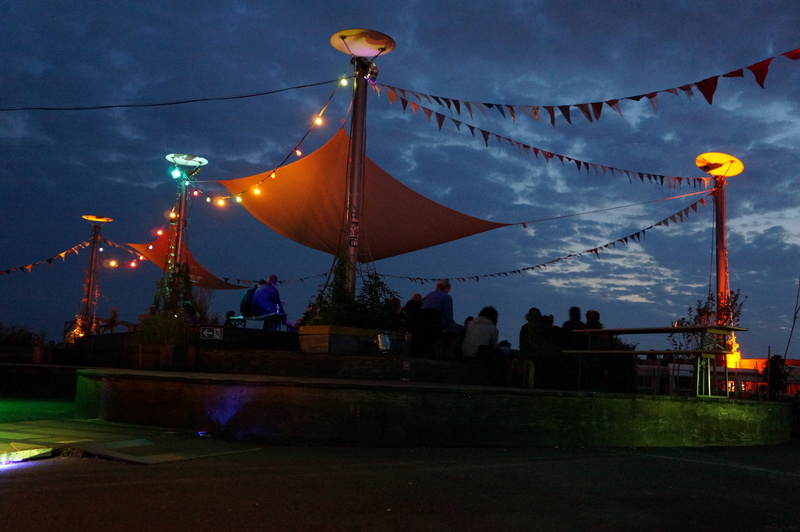 Before long, the skies cleared up for another blissfully sunny day–except not down where we were! It was bitter cold, and the sunsoaked mountains in the distance might has well have been on another planet. Crampons once again saved the day. Deep in a crevice, on a tail it seems amazing anybody was able to forge in the first place, I wondered how tall this cliff was. With a 3-D Google Earth model of the entire park now at my disposal, I have the answer: it’s approximately 1,300 feet tall (400 meters for the non-USA readers). But down on that trail all you can do is pause to stare up in amazement at the cliff towering above your head, and how even the little cliffs right in front of you are pretty huge if you think about it. Amazing views, but still no sun! …and more sun! Suddenly getting sunburned and dehydrated on a freezing morning in the mountains seemed like a real possibility. Oops. Before long we shed much of our winter gear, and basked in the warmth. It was amazing, the beauty and serenity of being far out in the emptiness, looking out over a different valley from Zion, with no people or roads or anything, and early enough that we had the whole place to ourselves. At last, we rounded another mountain bend and the main valley came back into view. Definitely worth treading carefully on this stretch, even with crampons. It’s difficult not to get held up by the view every few minutes on this part. Just amazing. A second day of some of the best hiking I’ve ever done in my life! A perfect blanket of snow to frame each picture. An amazing vista of the snow-filled valley. Angel’s Landing, that knob of rock sticking out from the right side of the valley, looks so small from up here. You can risk your life in various ways plodding off into the snow trying to frame just the perfect picture of this place! Which I was inclined to do…but only a couple times. My mom reads this blog after all! Hello there! After a hiatus of over 24 months, I’ve decided to resume posting on Cape to Milan. Memories stay a whole lot fresher when I’ve got this blog to fall back from, and a steady trickle of people interested in the places Caroline and I have been still seems to pass through, so why not keep adding to this? Caroline also might add some of her travels. She’s been writing posts for other sites lately, but she may cross post them here or post something here occasionally. I’ve been a bunch of places in the past couple years, and it might take me a good long while to catch up to present (especially since I keep going to more places, meaning the backlog grows ever longer!). So I’ll start where I left off, in the first big trip I took after Eastern Europe in 2015: a winter journey to Zion National Park, Utah. 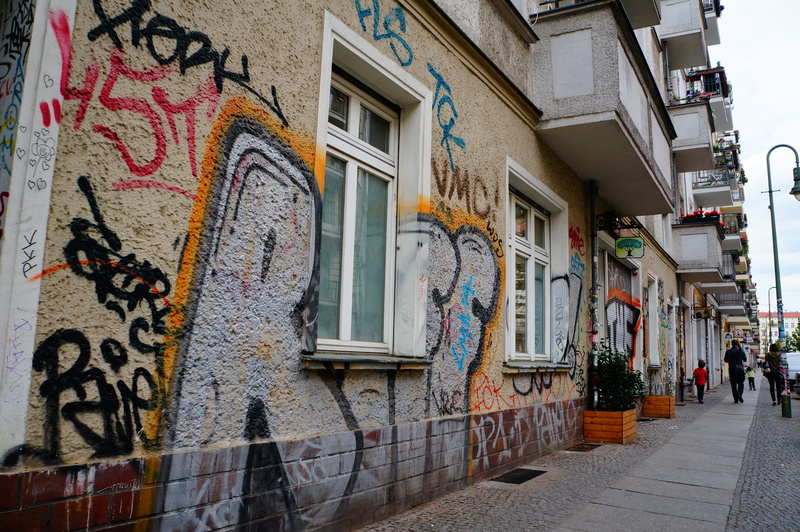 Berlin has more than enough sight-seeing opportunities and historical attractions to keep any visitor busy for their stay, but the city’s real charm is in its quirky, graffiti-smothered neighborhoods, easily accessible by the city’s public transportation. 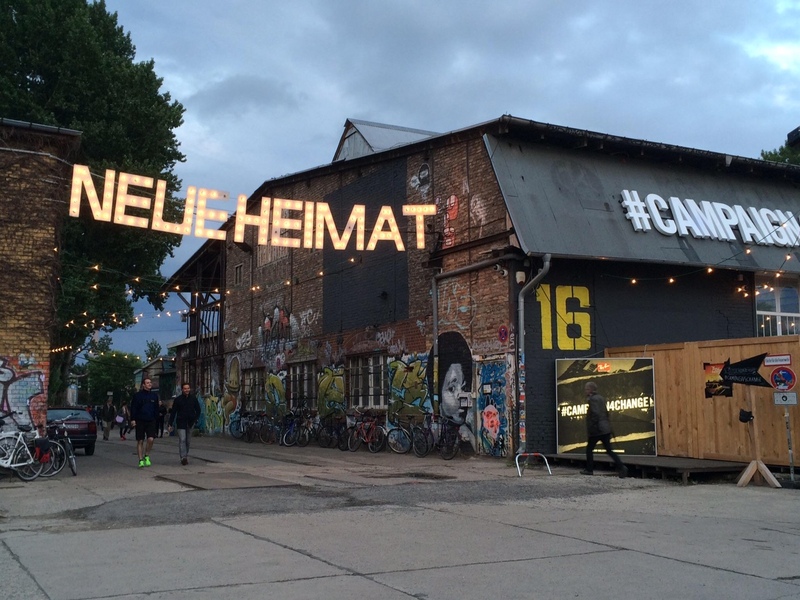 We met up with one of Chrissie’s friends at Neueheimat, a food market in the neighborhood of Friedrichshain. Long picnic tables are encircled by vendors selling vegan Yemeni wraps or Vietnamese pork buns. There’s a small cover charge; ours went to supporting the “food art” performance that evening. 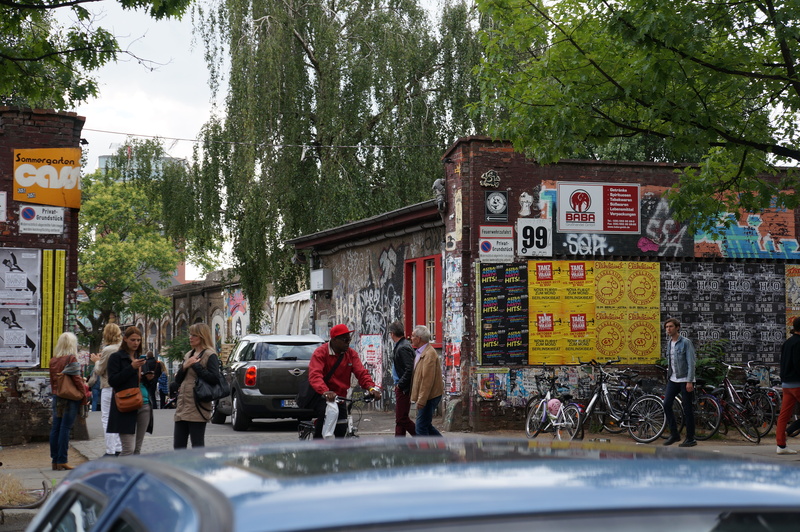 Walking around Friedrichshain. 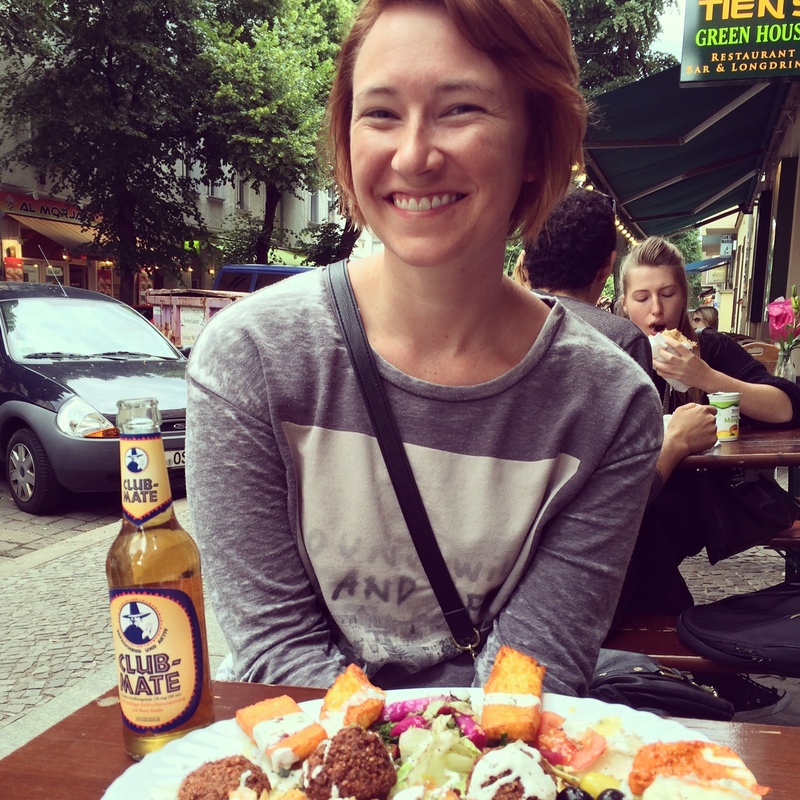 We recharged in the area with some Lebanese food and a Club Mate. Although this mate tea soda has been around for a while, it’s recently become a hipster staple in Berlin. 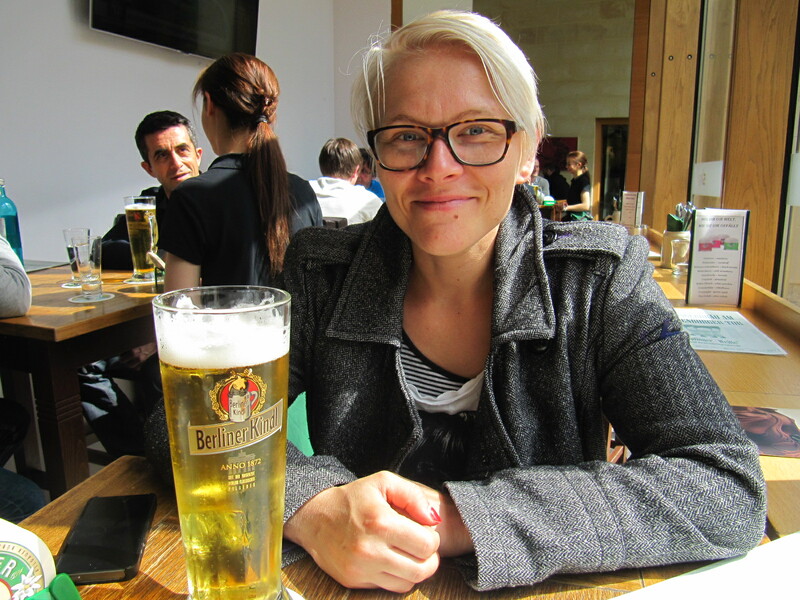 The high caffeine content is essential for going out in Berlin, where clubs don’t get busy until 3 or 4am. Once when we tried to head home at 6am, a girl we met on the subway looked at her watch in total shock and said, “It’s way too early! You have to get out at this stop.” She gave us directions to a nearby dance spot where the sunlight was already streaming through the windows and lighting up the dedicated dancers. 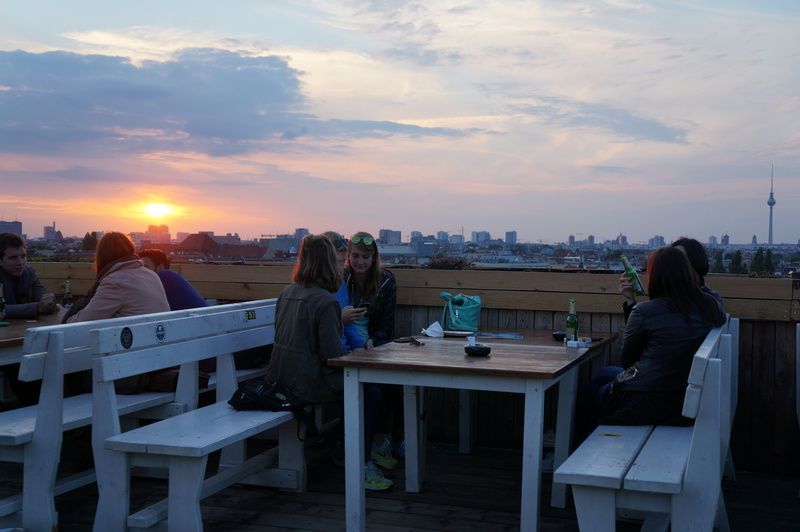 One of our favorite spots was this hidden rooftop bar in the neighborhood of Neukölln. 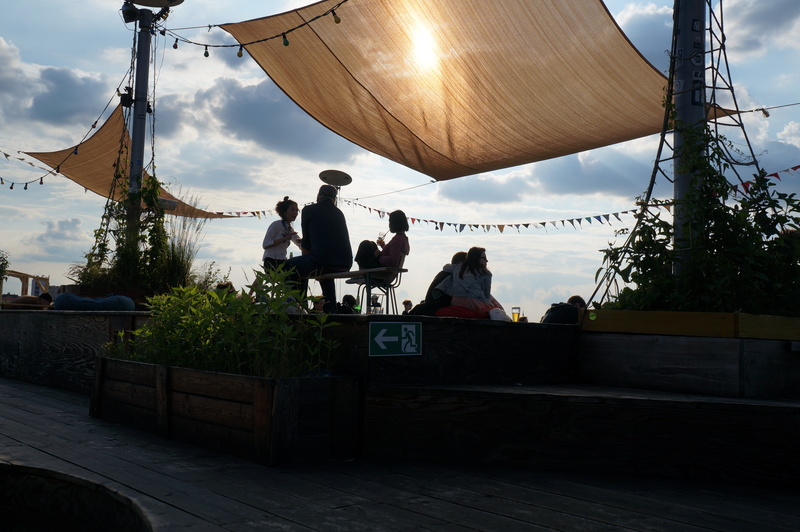 Klunker Kranich offered an unbeatable view of Berlin. Here you can see the TV Tower in Alexanderplatz (you’ll see a close up later). The patio is a fantastic place to relax, drink some wine, snack on some antipasto or ratatouille, and watch the sunset. 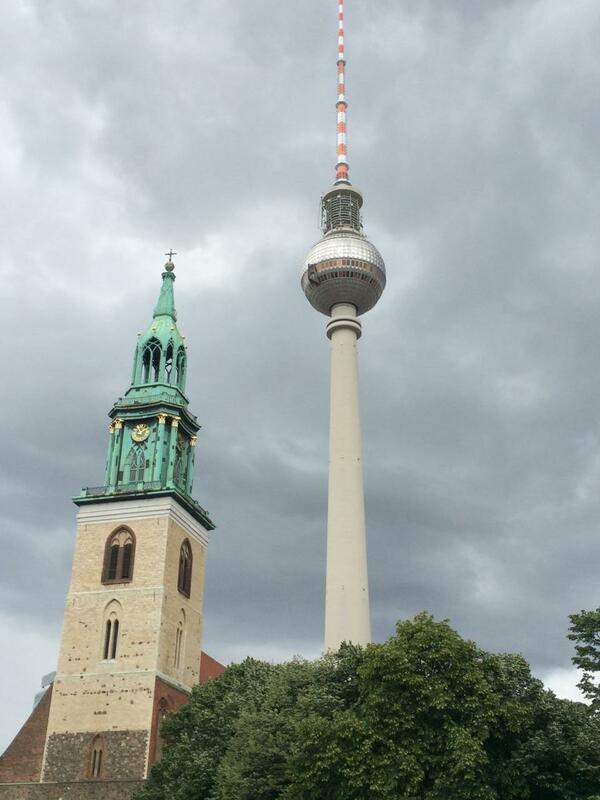 As promised, here is your close-up of the TV Tower in Berlin’s Mitte neighborhood. This is home to most of the important sights. 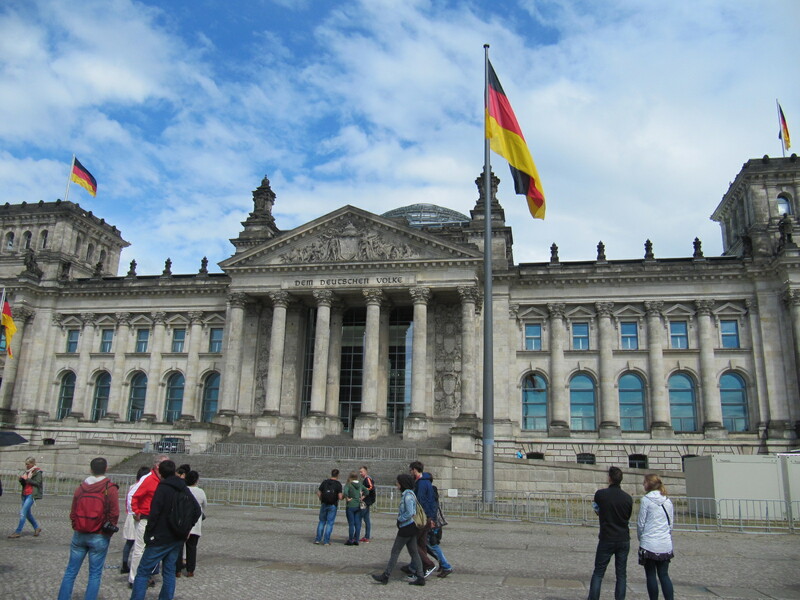 The Berlin Cathedral Brandenburg Gate (or Brandenburger Tor, to be more exact) Reichstag (Parliament), just before it was blocked off for a rally in support of Germany opening its arms to refugees. 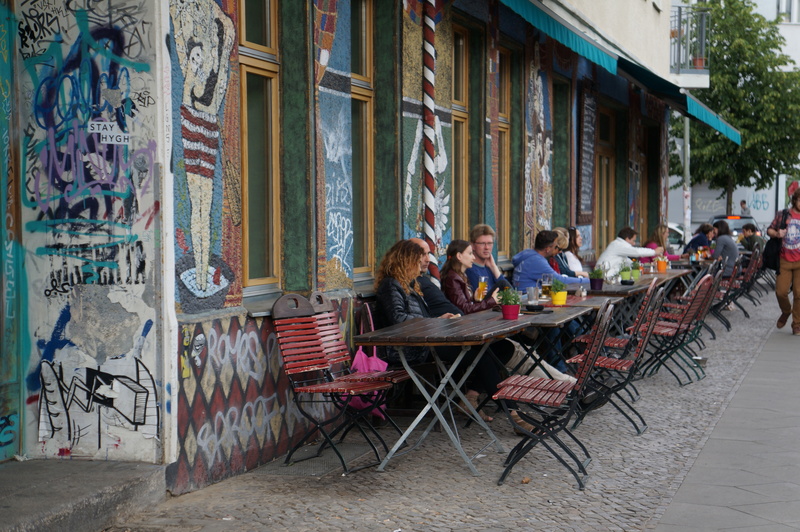 No matter where you are in Berlin, you’re never far from a great spot to give your feet a rest and enjoy a beer. 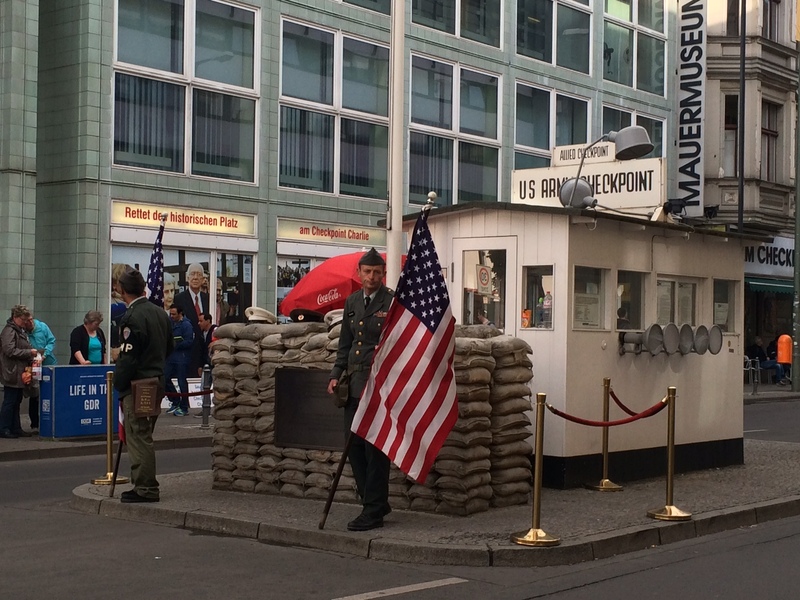 Checkpoint Charlie, once a crossing point between East and West Berlin. 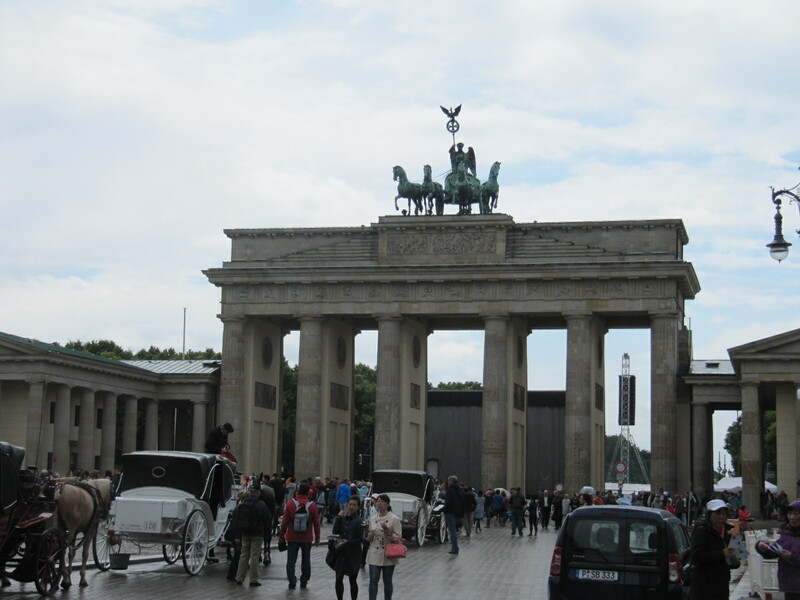 There are plenty of other reminders of Berlin’s divided past. 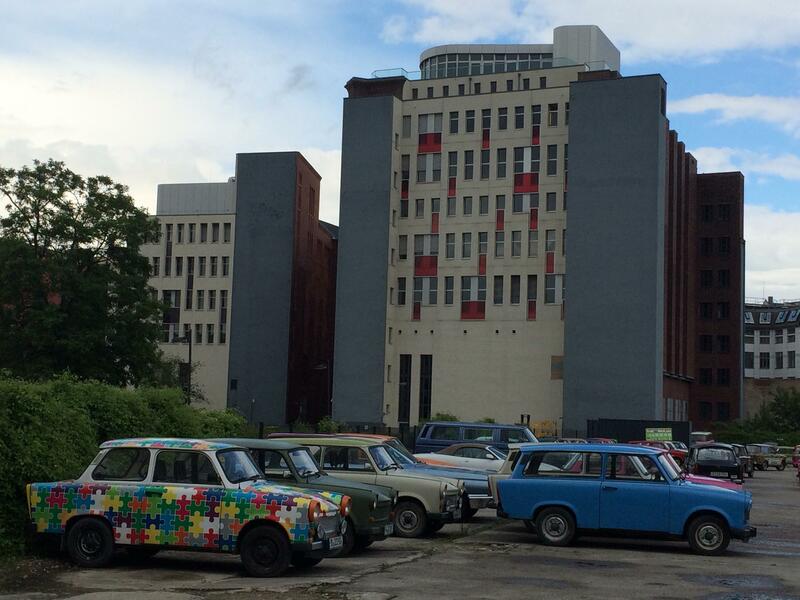 These cars–called The Trabant or “Trabi”–were the standard East German vehicle. 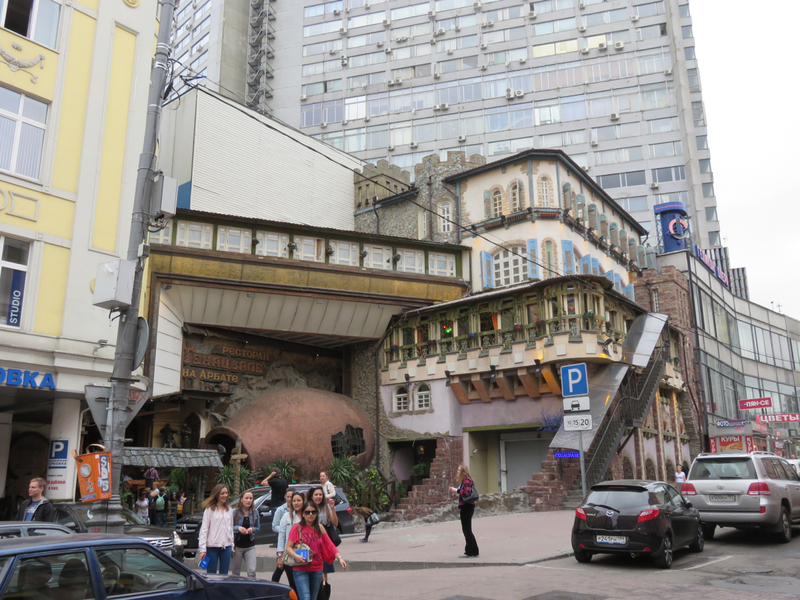 In their second lives, they are colorfully decorated and rented out to tourists. 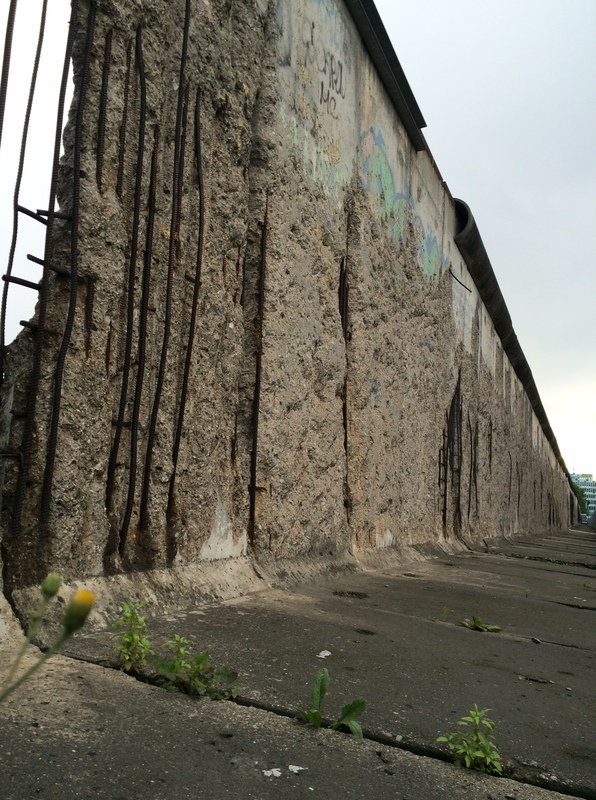 Remnants of the Berlin Wall stand in 2 places. The first is Mitte, where the wall is lined with a really informative display called the Topography of Terrors. The wall is lined with glass hangings filled with photographs and short descriptions about each. 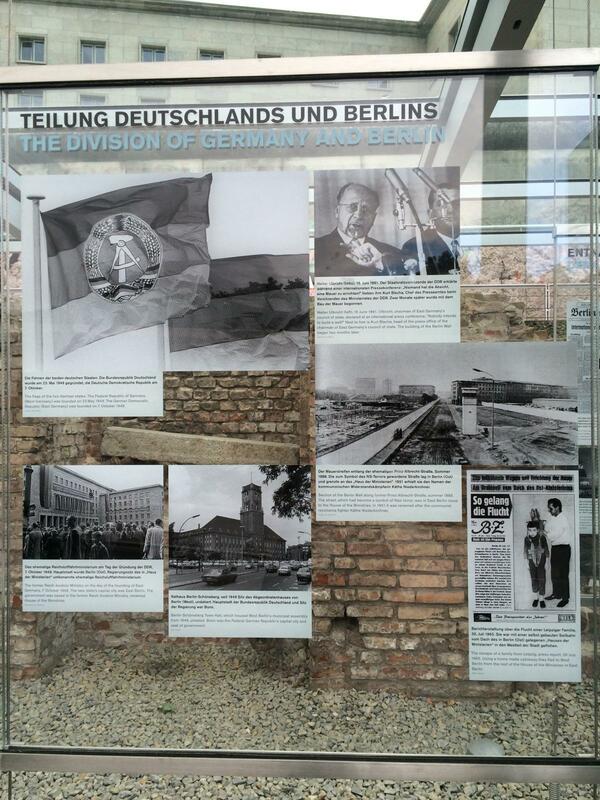 The pieces of glass allow you to see the wall behind them and serve as a timeline from before World War II until the fall of the Wall. 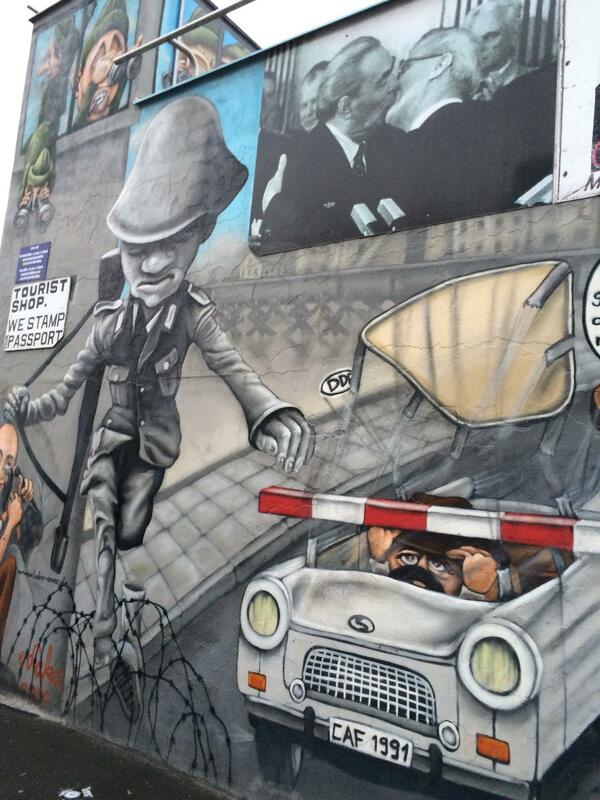 The second place you can see the Wall is the East Side Gallery. 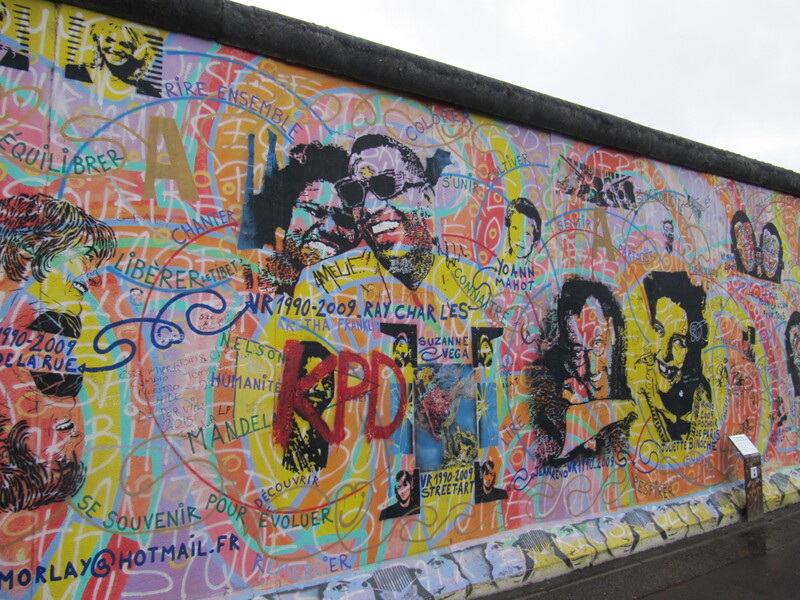 While the Topography of Terrors serves as a lesson and a reminder of a dark past, the East Side Gallery’s kilometer of vibrant murals offer hopeful artistic expressions of freedom and peace. 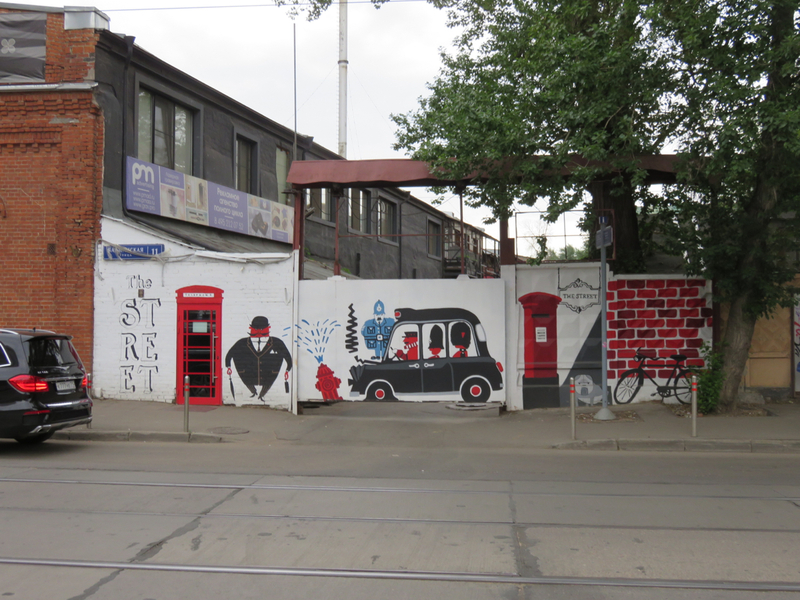 It’s a perfect way to reimagine the wall in a city that loves its street art. 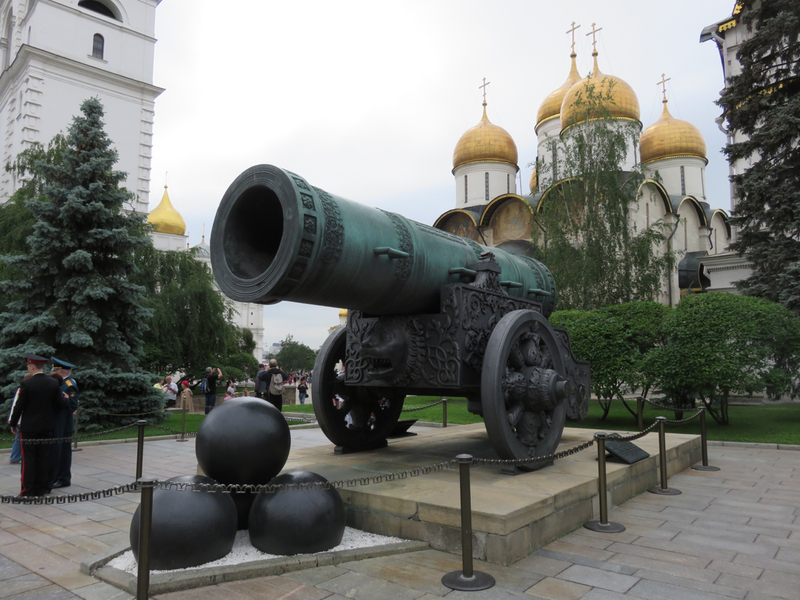 In my Introduction to Moscow post, I admitted that I had wondered if there was much more to do in the Russian capital than see Red Square and the Kremlin. The answer: absolutely! 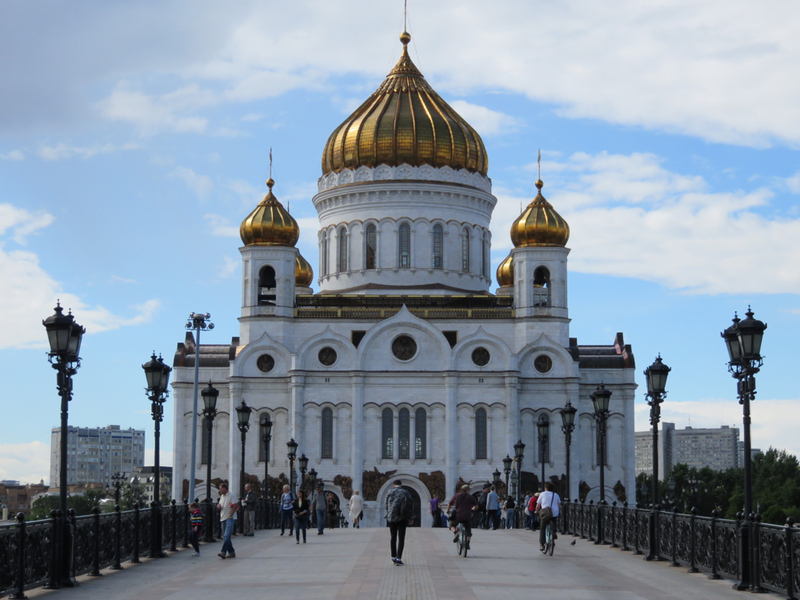 Moscow is a great city to explore. 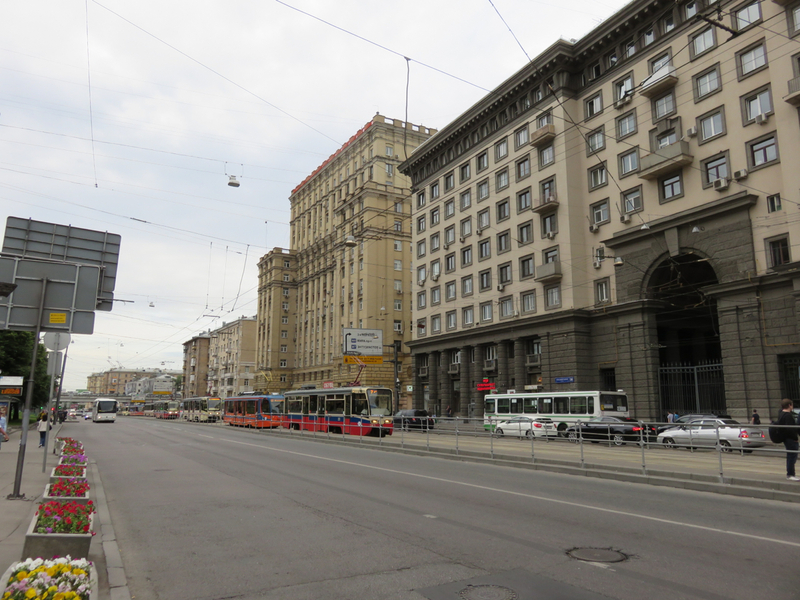 For starters, and perhaps unsurprisingly, Moscow has no shortage of imposing Soviet-era buildings. 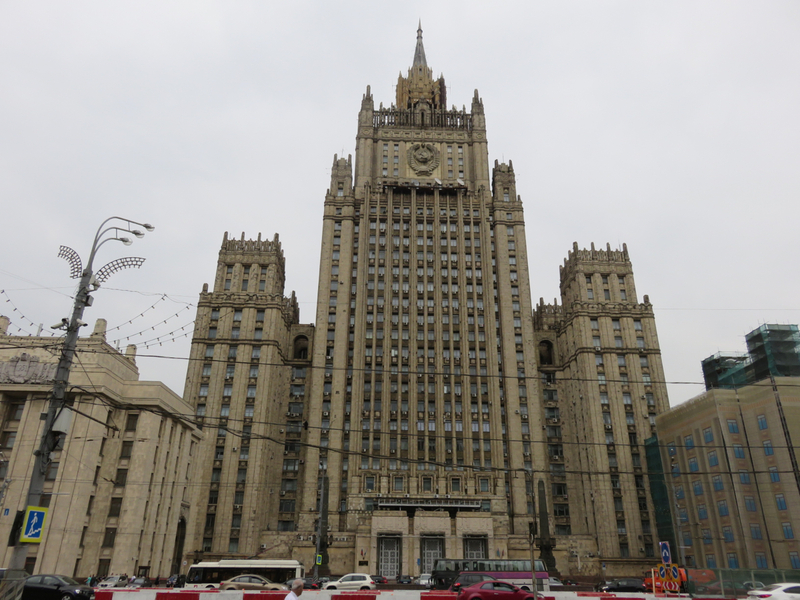 This one, the Foreign Ministry, sort of reminds me of a more menacing version of the City Hall in Buffalo, New York. 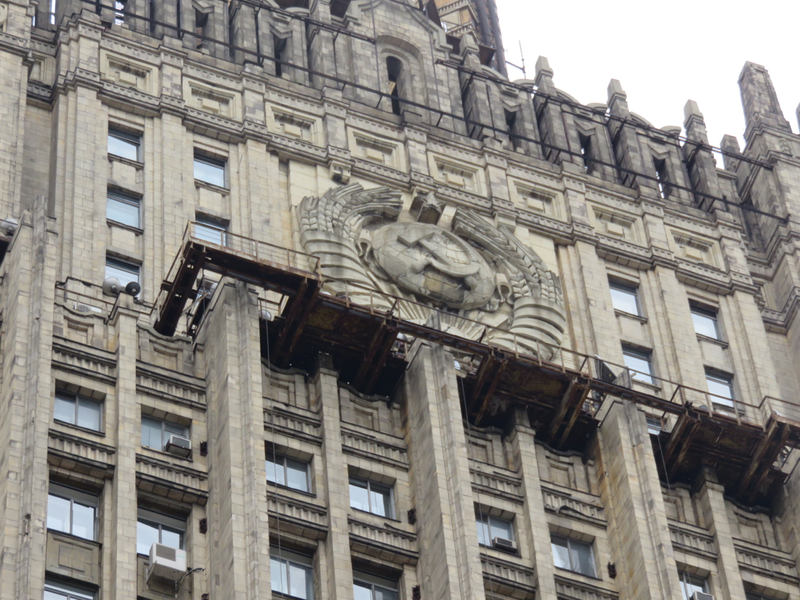 The hammer and sickle, as a massive architectural feature. 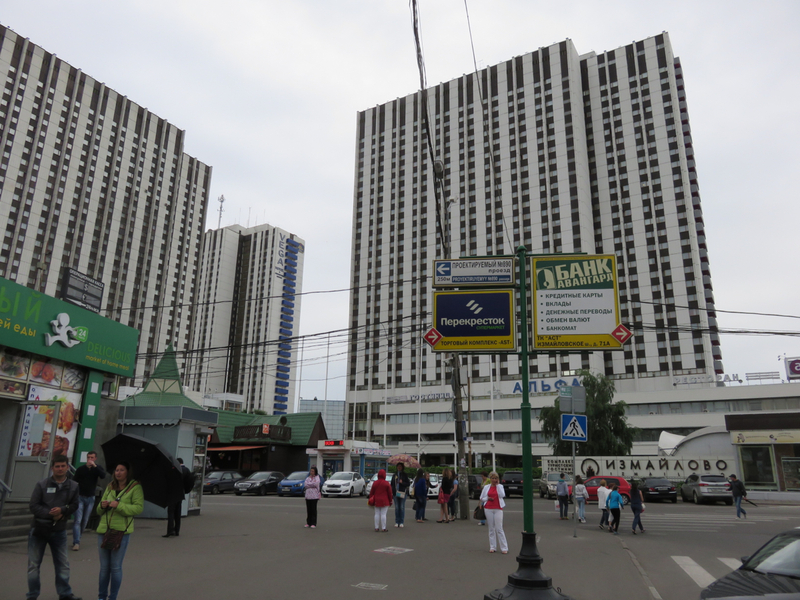 Another of the Seven Sisters, a collection of distinctive skyscrapers Stalin built throughout the city. Each rises starkly in the background of many vistas. Scenes like this are straight out of 1984, with the strength and omnipotence of the government radiating over the city. 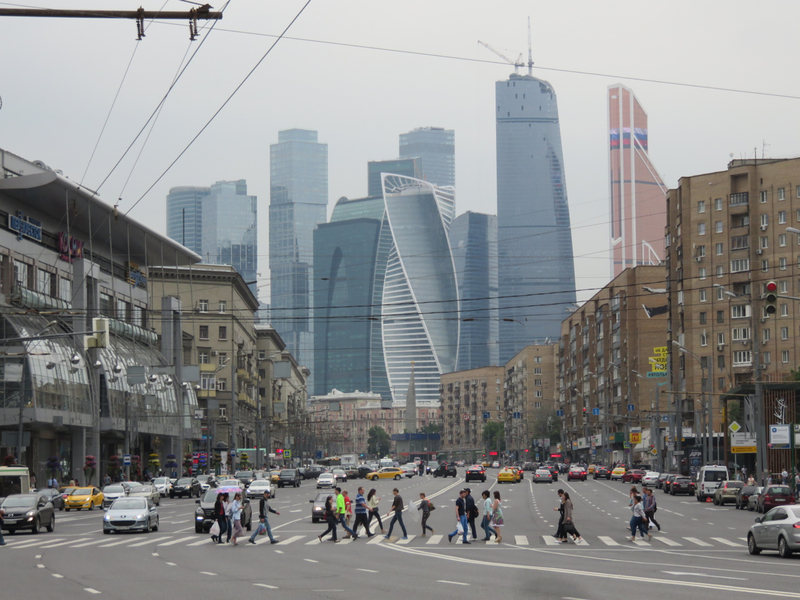 Nowadays, the relics of old Soviet glory clash with the surreal towers of glass and steel in Moscow’s gas-fueled business districts. It might not match the sheer size of Shanghai’s Pudong, but it still packs quite a punch visually! 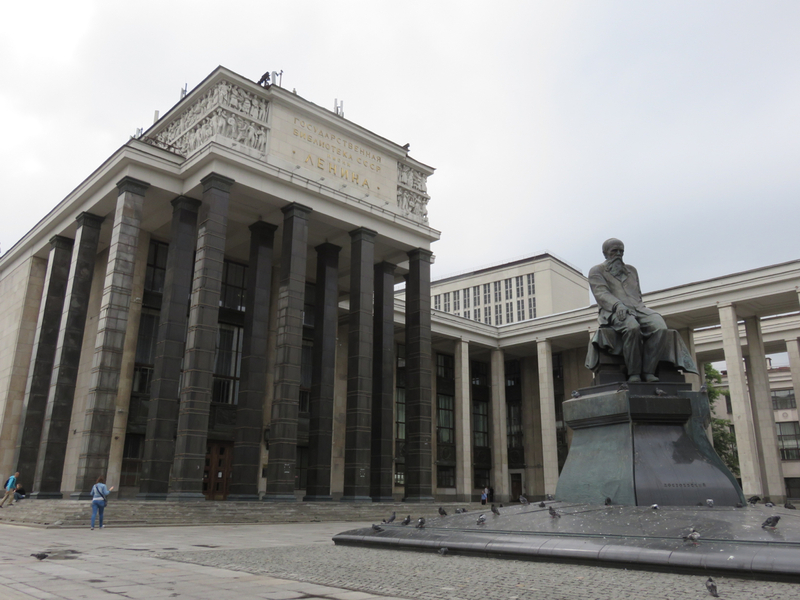 I gathered that the Soviet style of architecture really embraces square, vertical columns meeting horizontal beams. Even suburban metro stations exhibit the exact same style. 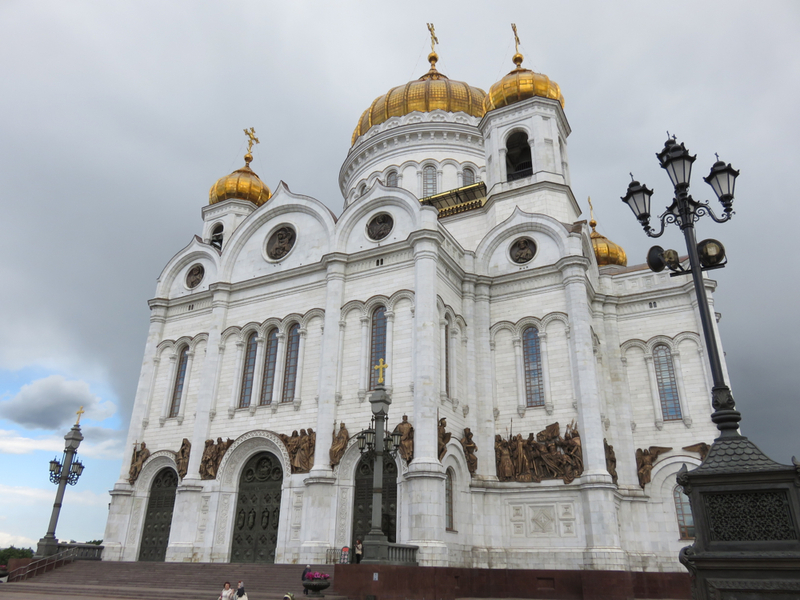 Moscow’s second most impressive cathedral: the Cathedral of Christ the Savior, unfortunately destroyed by Stalin in the 1930s and rebuilt only recently. The biggest shame of all is that the building the cathedral was razed to make space for was never even built! It was to be a massive capitol building, taller than the Empire State Building, when construction was halted by World War II. 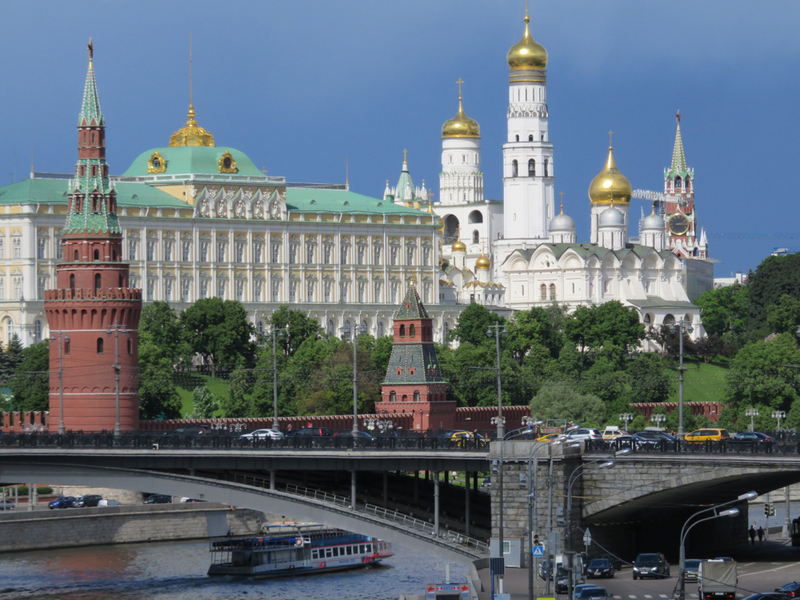 A view of the Kremlin in the distance. 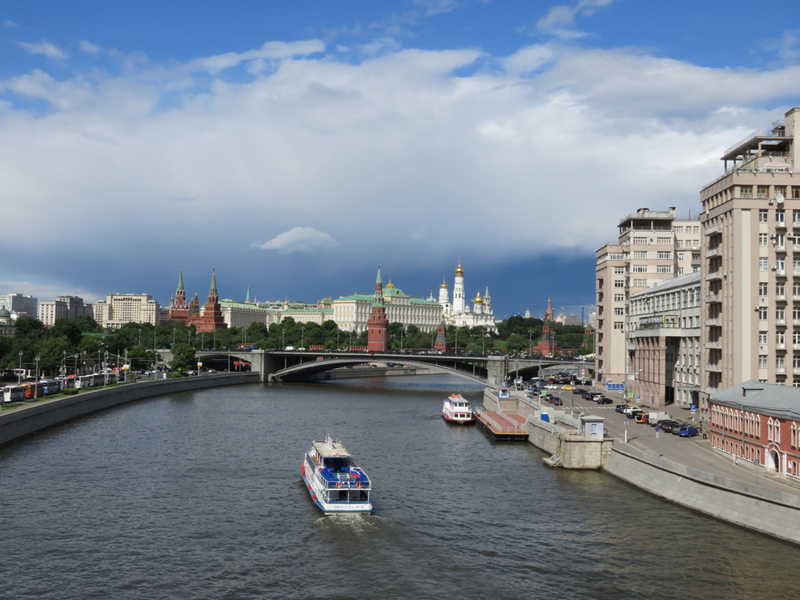 Sitting across the Moscow River from the cathedral is an unusual place: the Red October chocolate factory. 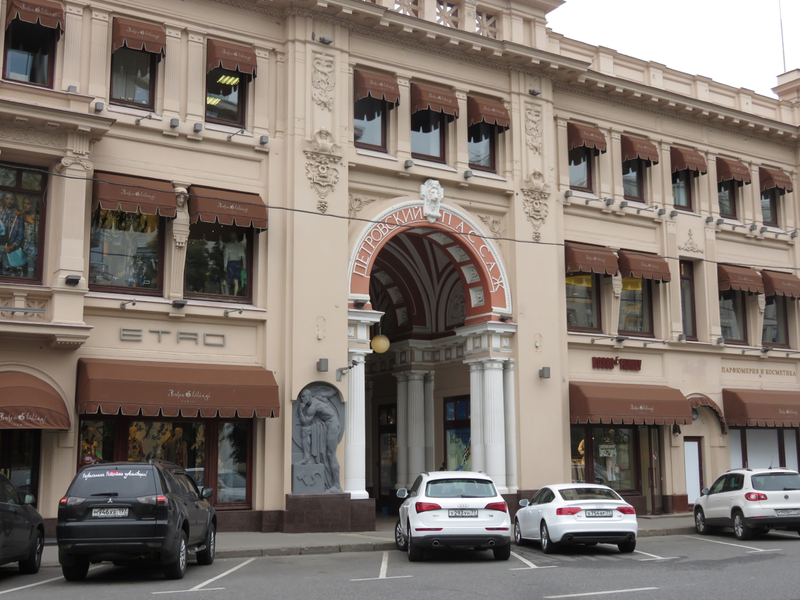 Originating in the Tasrist era and serving as a national icon throughout the Soviet era, the chocolate factory is now filled with trendy shops and clubs, with a more liberal vibe. A bit of Portland in the Red October factory. 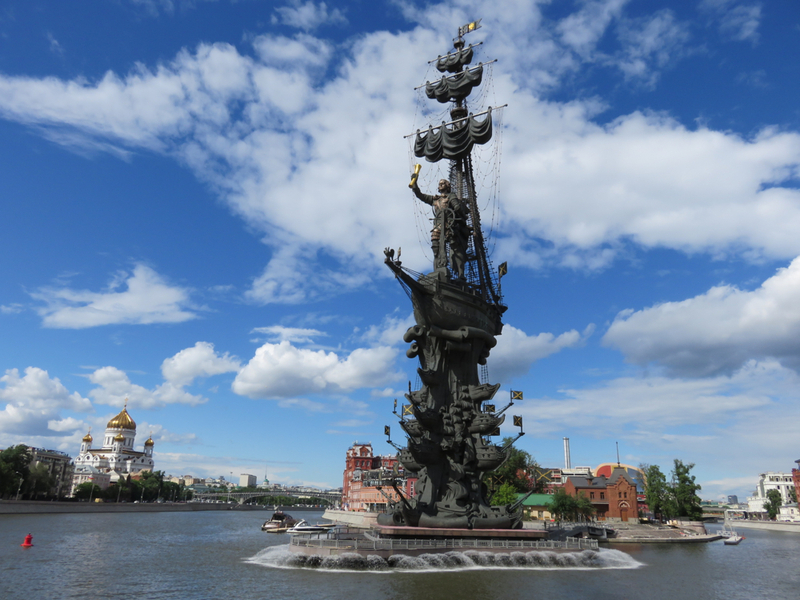 The nearest neighbor to Red October: a massively disproportionate tribute to Peter the Great. Taller than the Statue of Liberty but clearly lacking the benefit of any measure of French taste, the monument oddly exalts the man that moved Russia’s capital to St. Petersburg. 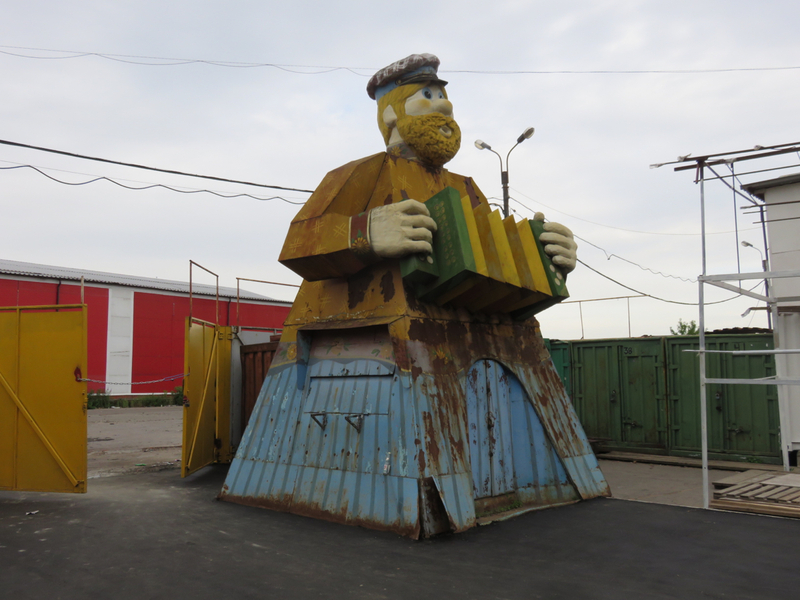 Nearby, Fallen Monument Park includes a curious mix of quirky art and Soviet icons. “The USSR, a Haven of Peace”. Alas, no place is free of consumerism. 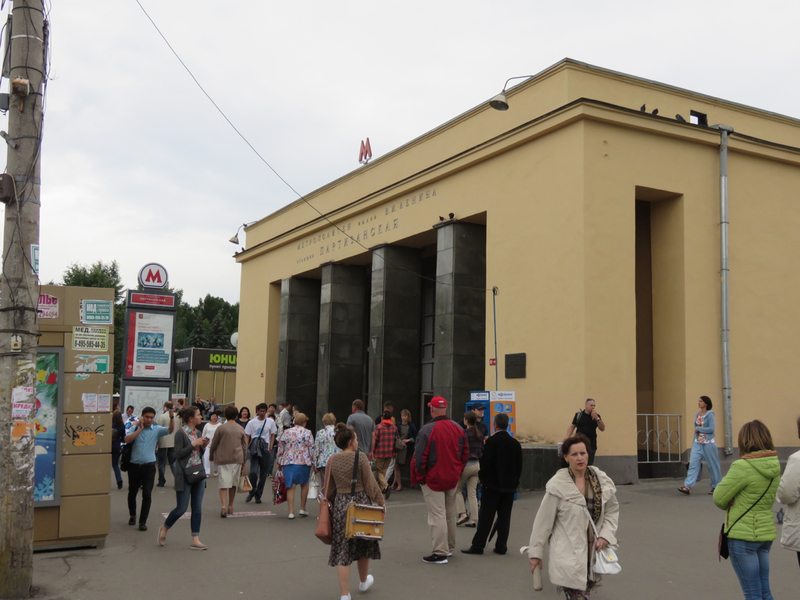 My single venture to the suburbs (still no difficult journey given the speedy metro) took me to Izmailovsky market, at the Partizanskaya metro station. 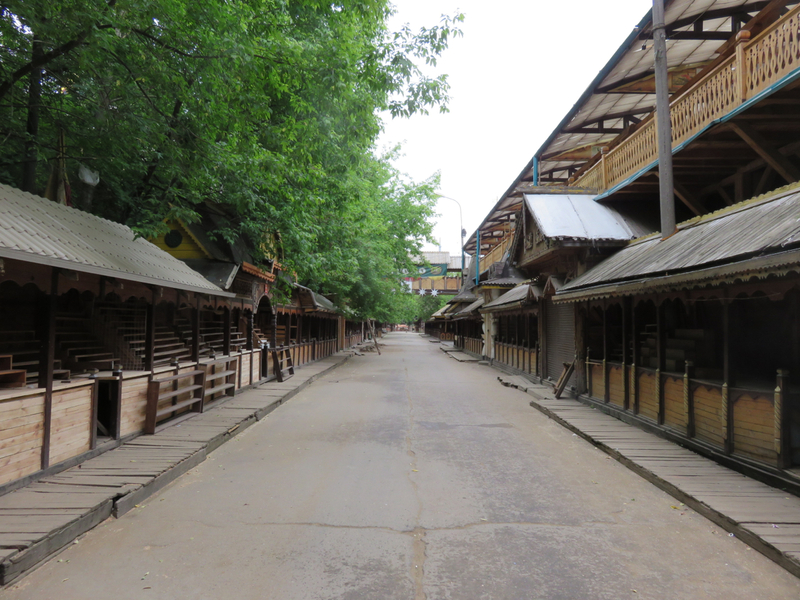 Beyond the prime hunting grounds for knick-knacks such a place was sure to offer, it was recommended to me as being the best place in the whole world to look for old Soviet stuff: a whole flea market devoted to it! 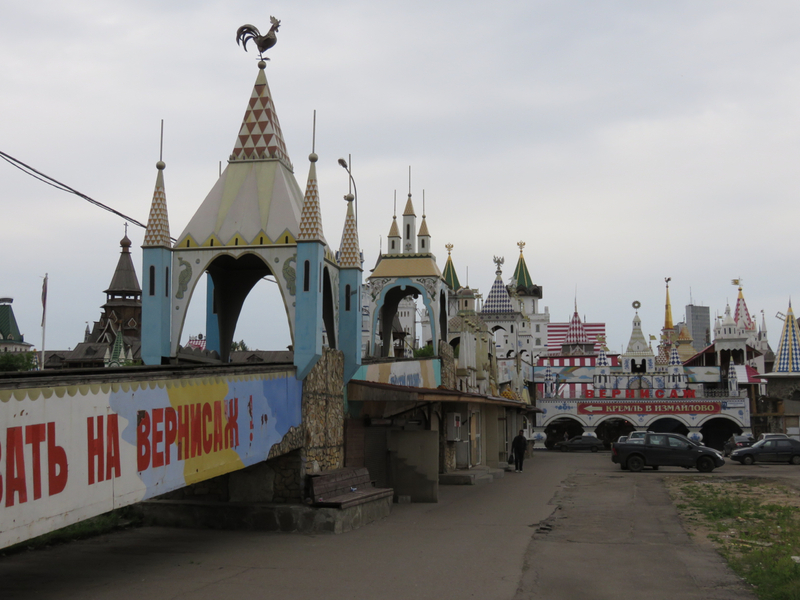 The place actually is pretty much a big, bizarre Russian theme park. 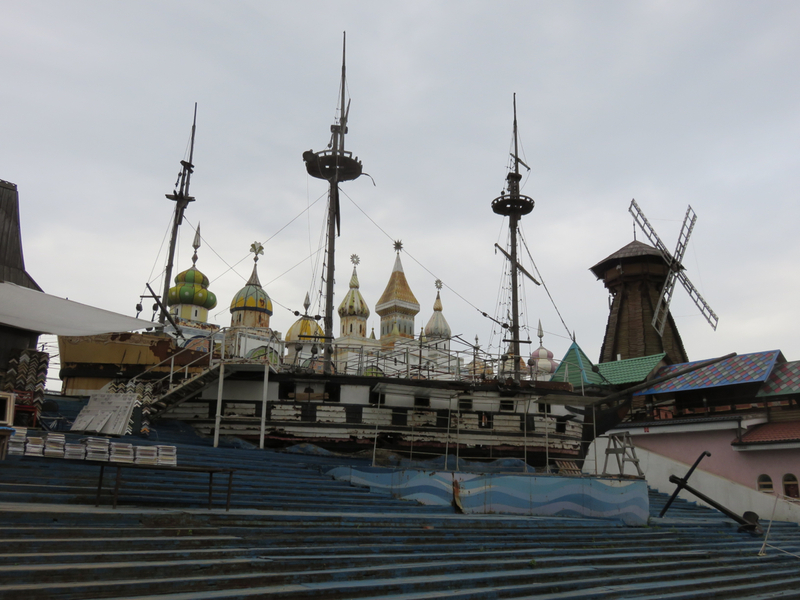 A big, bizarre, decrepit, mostly abandoned Russian theme park! Amazing! 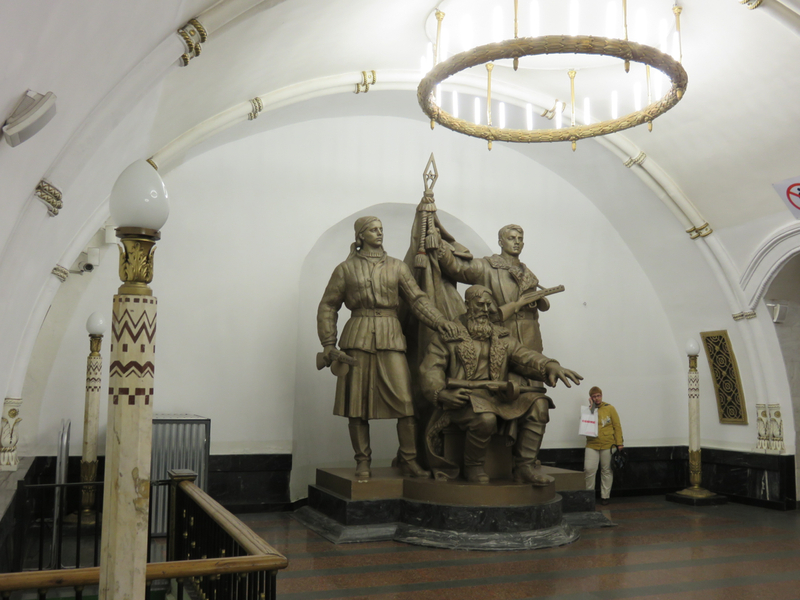 Unfortunately, not a Soviet relic in sight. The vast majority of the place sits empty, I was soon to discover. 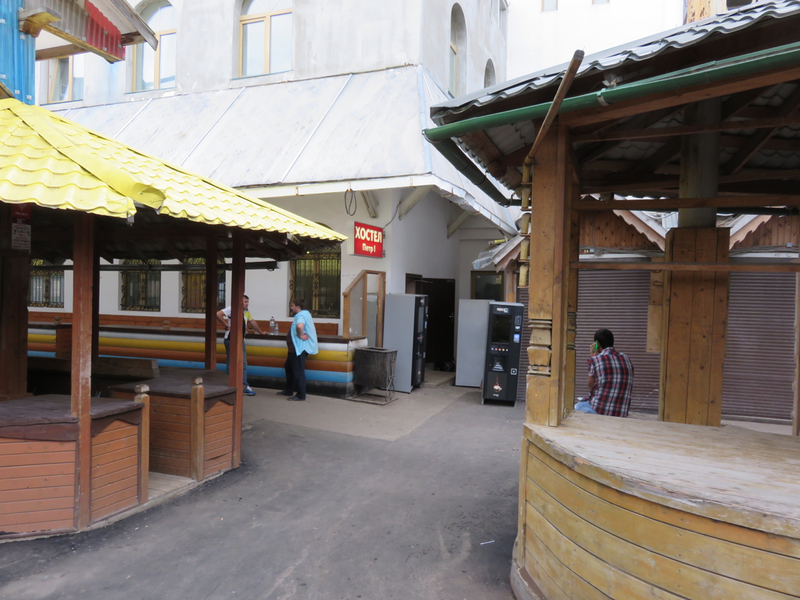 Except for…a hostel? That’s what хостел means, right? Who would possibly voluntarily stay at this place? Besides someone crazy like me, I guess. 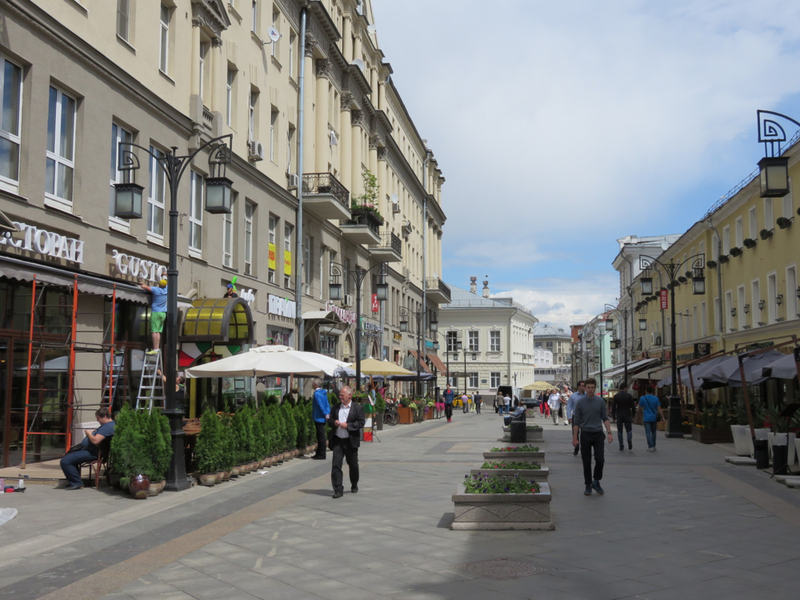 On the more traditional, and less-deserted, end of the tourist shopping spectrum, Old Arbat Street is like the Nanjing Road of Moscow, only with a lot less tackiness and vice. But not completely without tackiness! 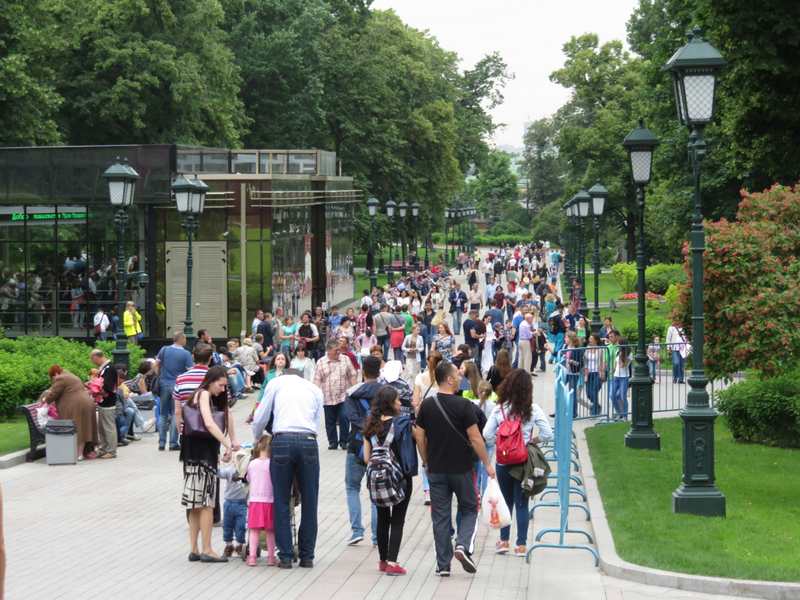 The road definitely caters to the higher-ruble class of tourist than the current incarnation of Izmailovsky market (which largely just catered to the likes of me, apparently, and I’m not a high-ruble tourist by any stretch). 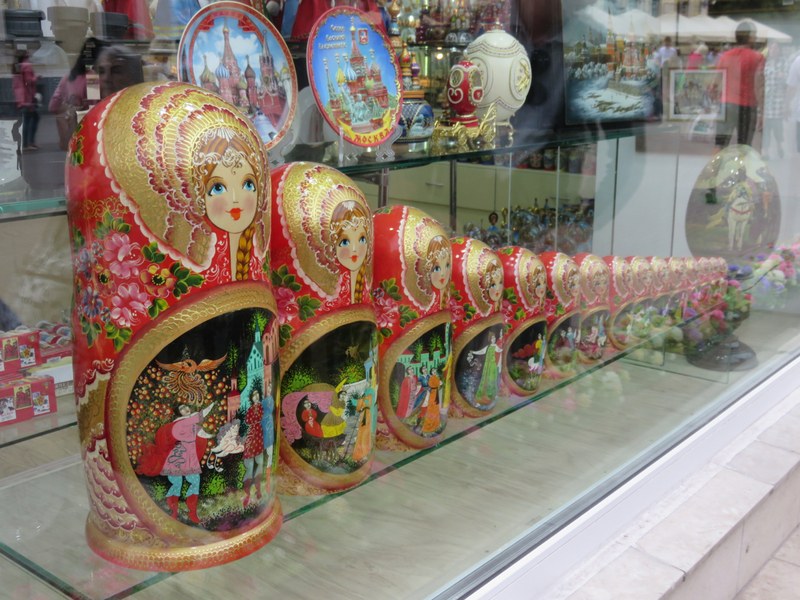 Matryoshka dolls, in amazing varieties and forms. You can spend a shocking amount on these things–into the thousands of dollars. The finest ones are all handcrafted with a multitude of dolls, each with different inlaid images. An almost manufactured-looking touch of graffiti. I was legitimately surprised to find a Shake Shack! 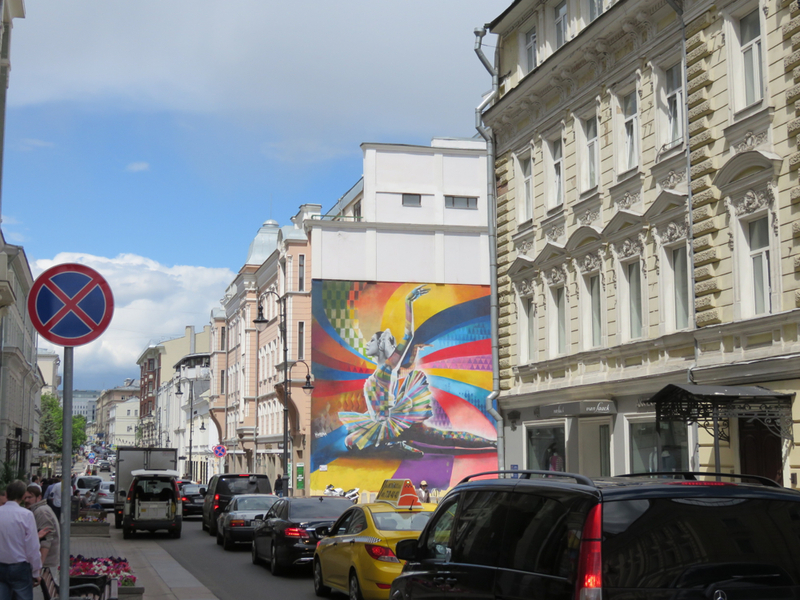 Moscow’s quirkier neighborhoods, east of the center. 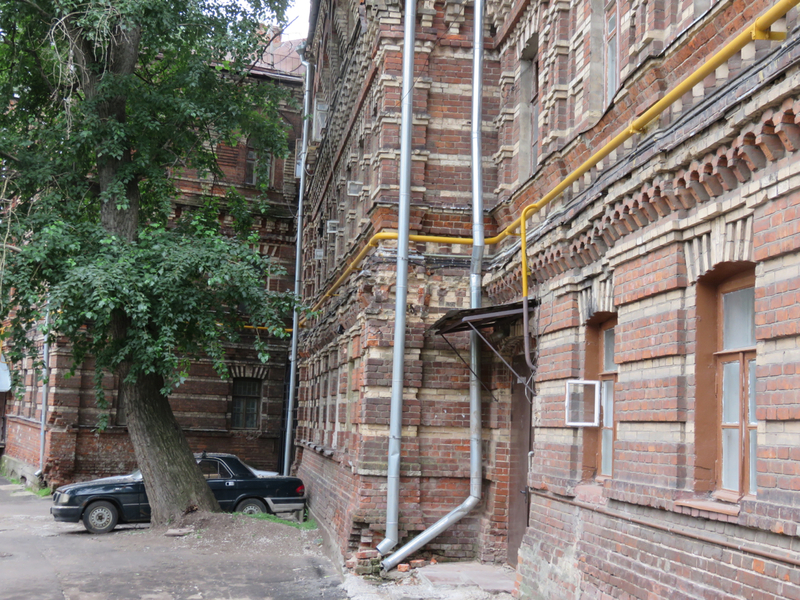 The city’s backstreets and alleyways, filled with interesting glimpses of the past. 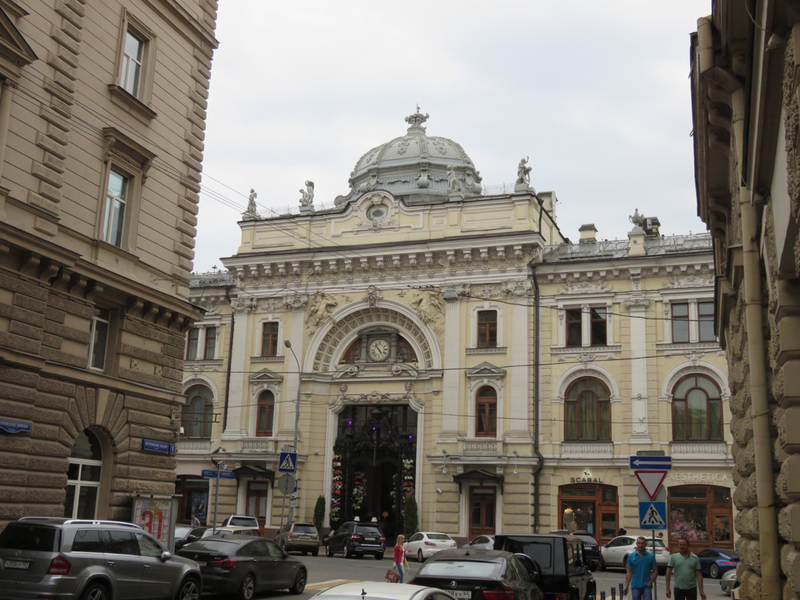 Majestic architecture on the city’s main streets. 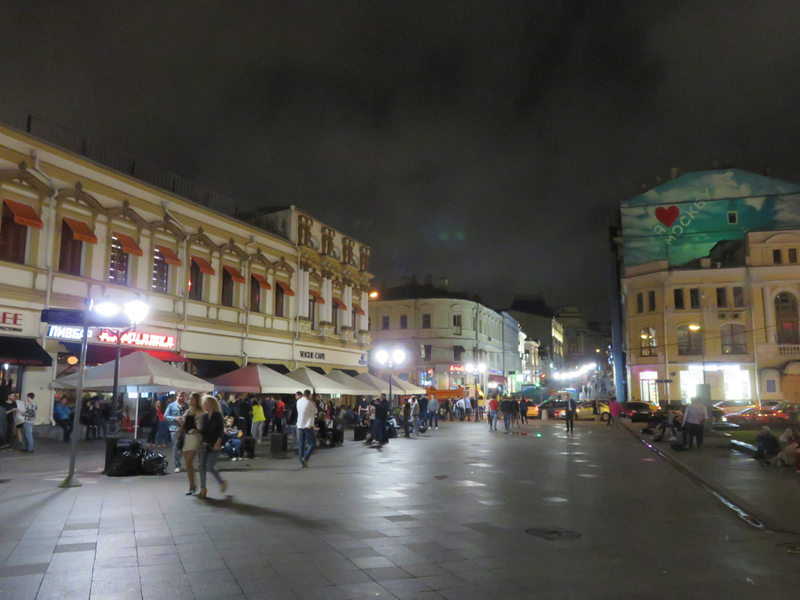 The club and cafe scene of central Moscow, known for being legendarily judgmental. Bouncers employ “face control” to ensure only the most desirable customers are admitted. Getting turned away sounds like a devastating outcome to waiting an hour on a frigid winter night! 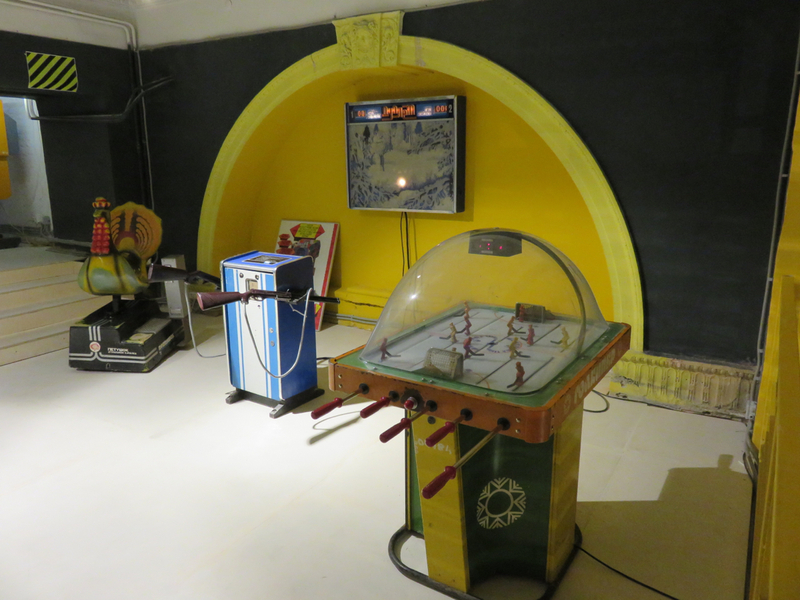 And, last but certainly not least, the Museum of Soviet Arcade Machines! 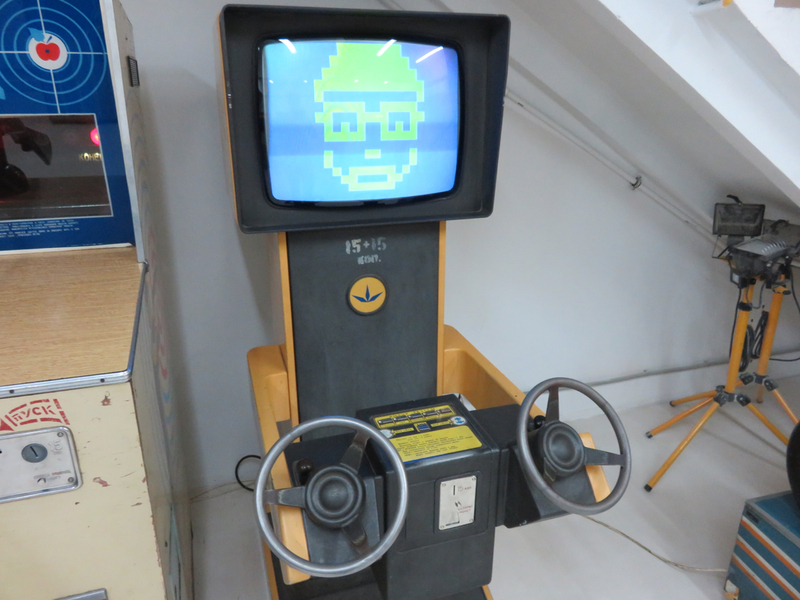 A rather inventive set of arcade games that have little resemblance to anything I’ve seen as an American gamer. 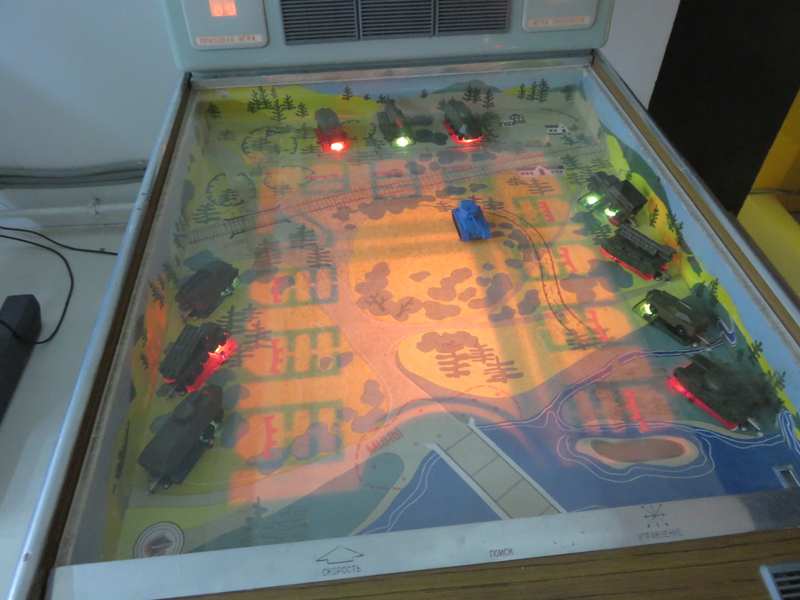 Most of the games either have to do with war, hunting, or racing. They use projections, screens, and lights in creative ways. 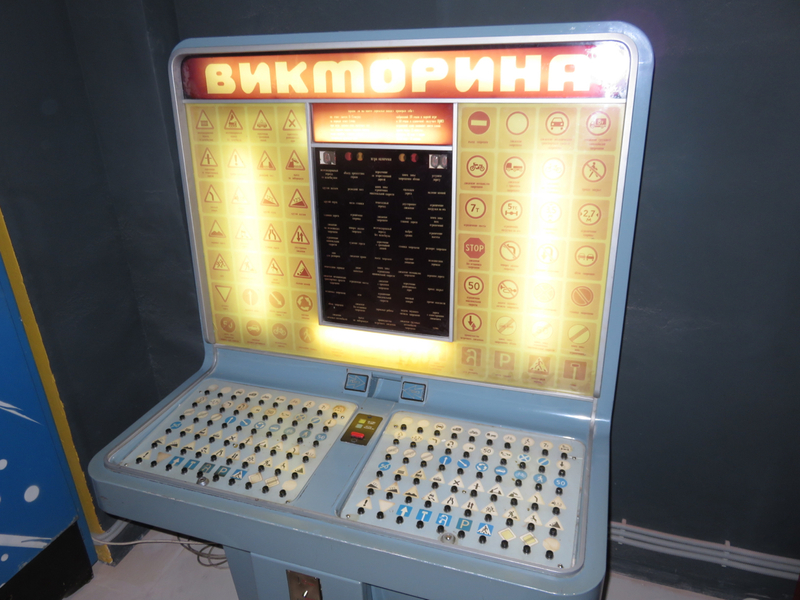 And, to this non-Russian speaker, often managed to be completely incomprehensible! 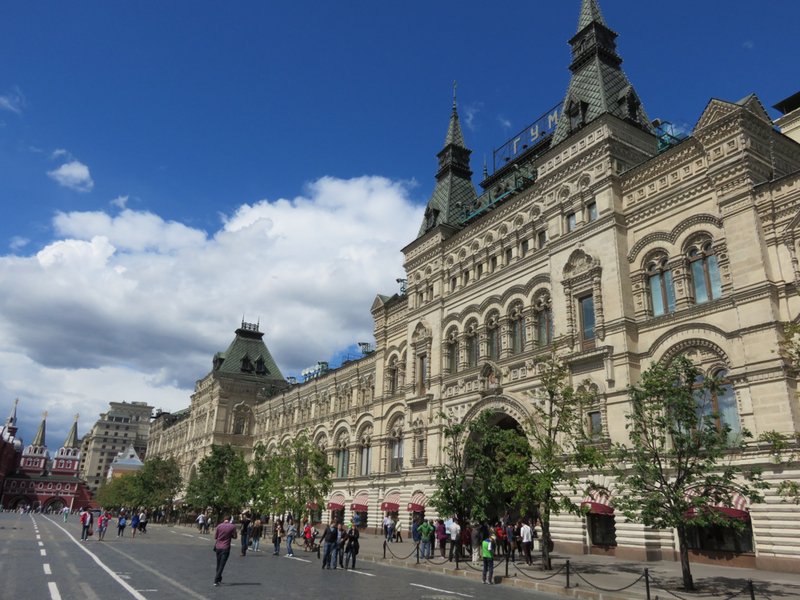 For Russian tourism, Moscow may play second fiddle to St. Petersburg, but Moscow boasts two world-class attractions sitting side-by-side: Red Square and the Kremlin. 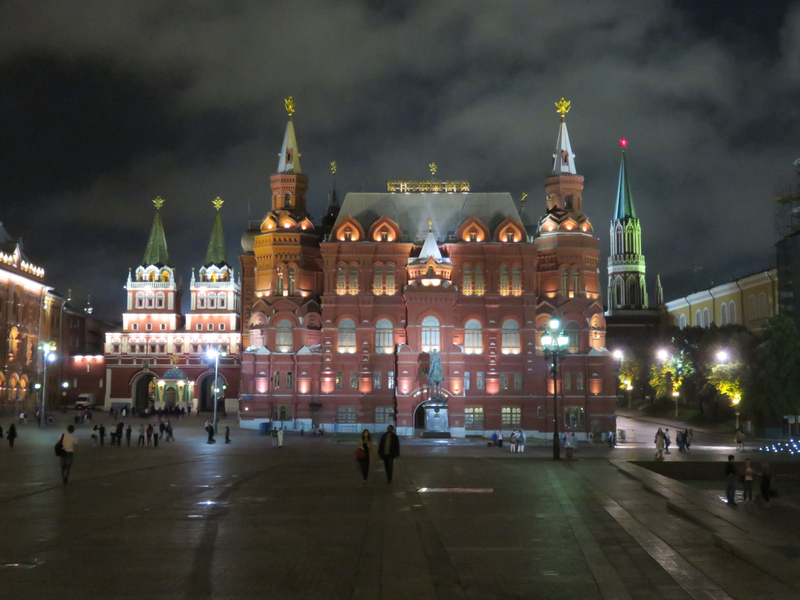 In addition to visiting during the day to see the attractions, a stroll through Red Square at night is obligatory to see the buildings lit up. 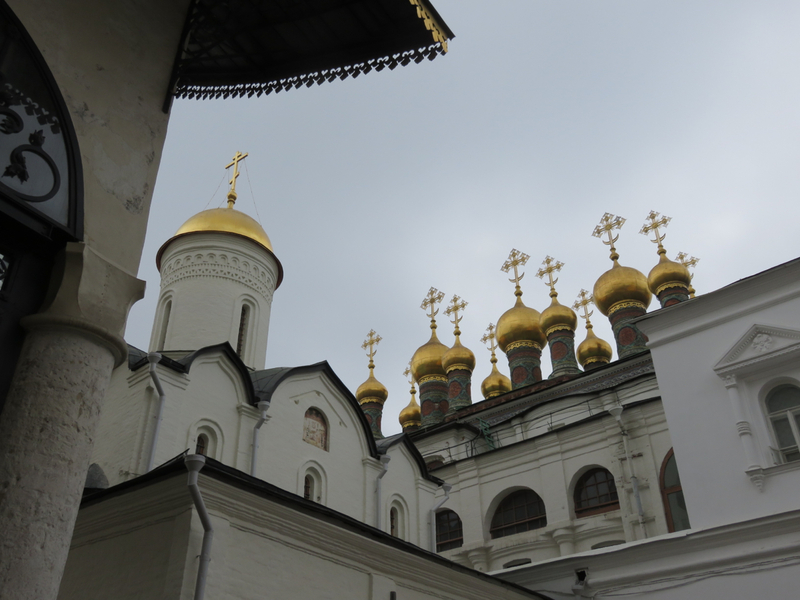 The incredible spires and walls of the Kremlin. 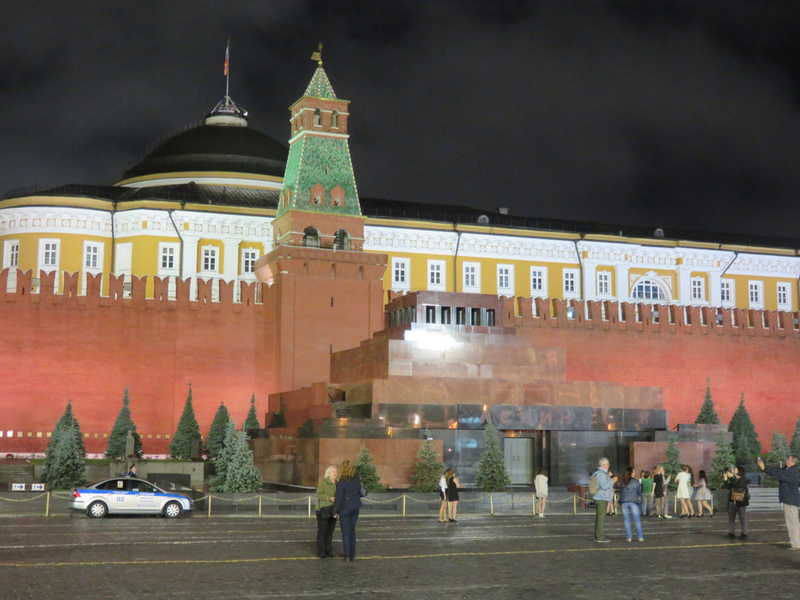 The Kremlin’s east wall lit up at night. 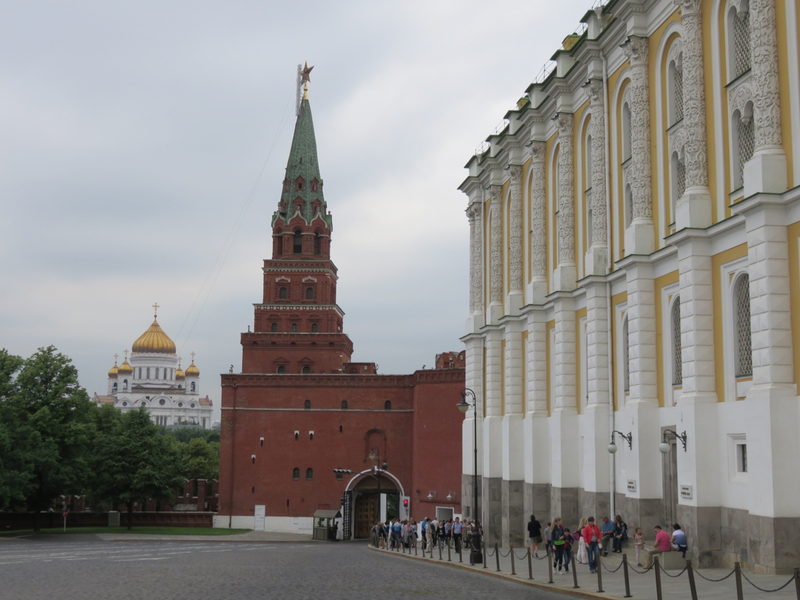 The guards here are serious: a guy had jumped the rope to get a picture in front of the Kremlin and, after hearing the blearing of whistles, walked briskly away. The guards pursued the guy and gave him a stern talking-to. 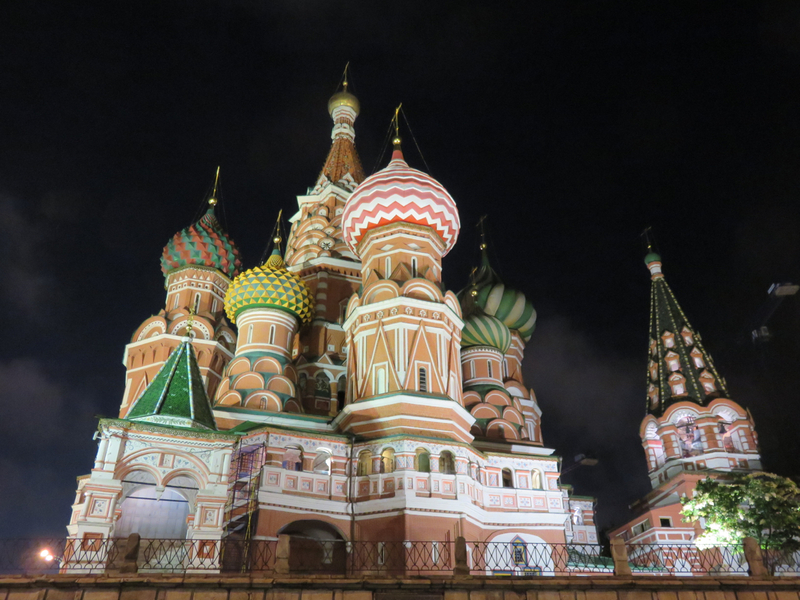 And there it is: the glorious St. Basil’s Cathedral, one of the most iconic buildings in the world. Stunning day and night, and from every angle. 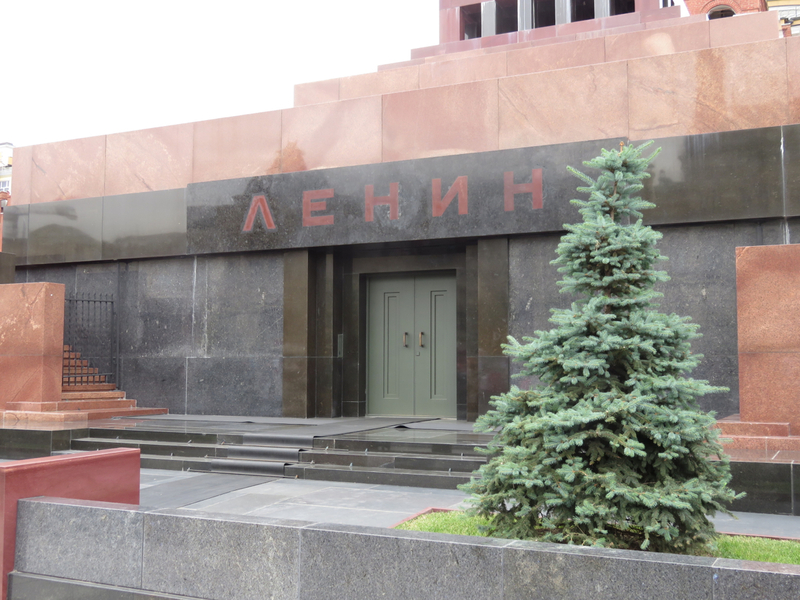 Alongside Lenin’s Mausoleum, a number of important Soviet figures, including Stalin, are buried. 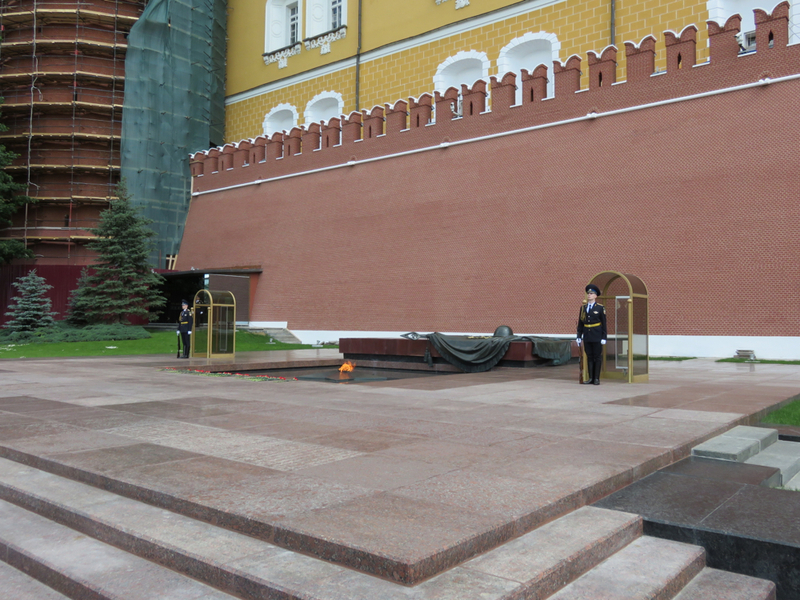 Russia’s Tomb of the Unknown Soldier. 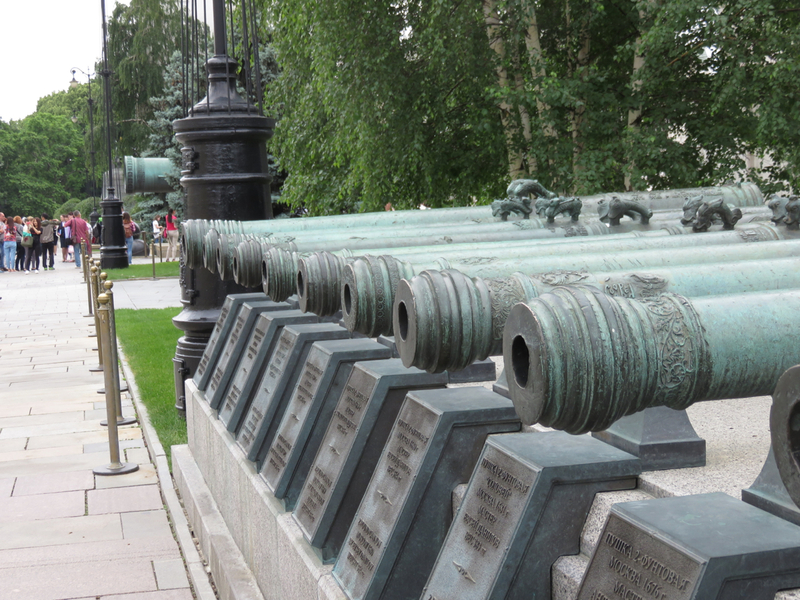 Flanking the Tomb is a monument for each of Russia’s Hero Cities of World War II. 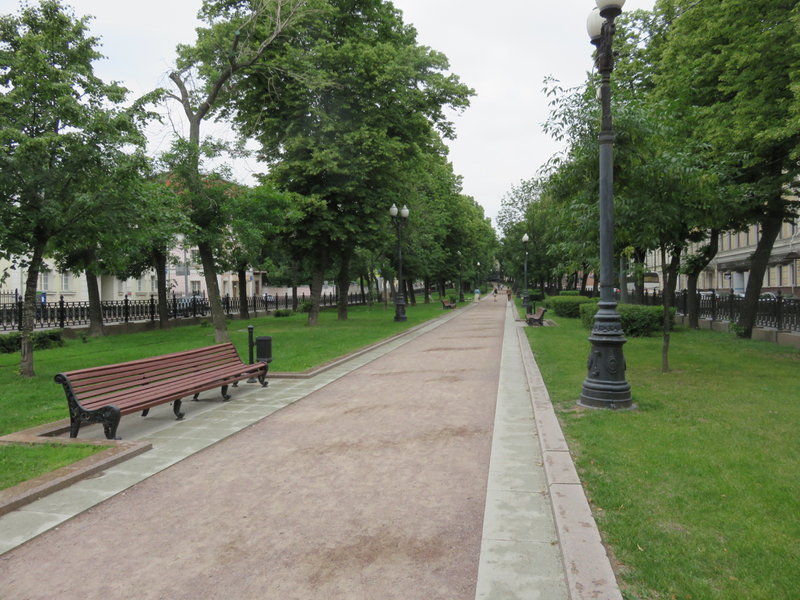 To the left, the Crimean city of Sebastapol; to the right, Odessa. 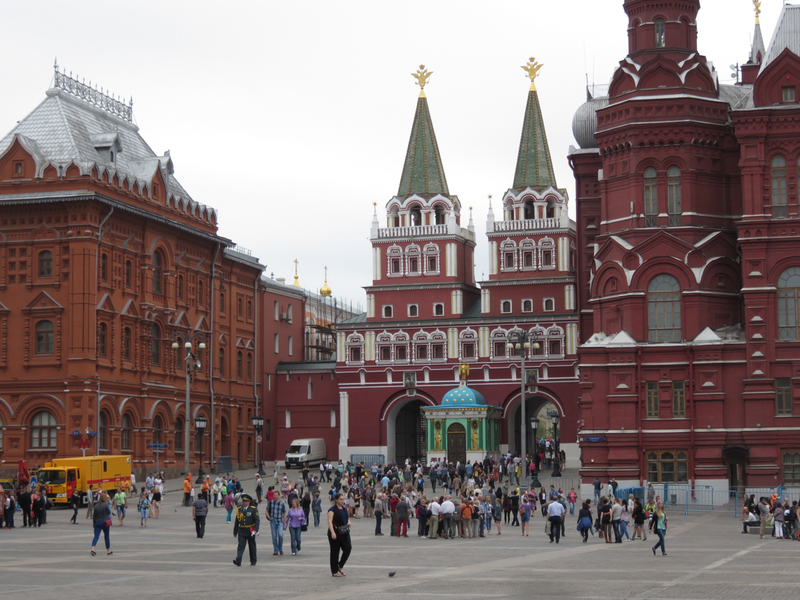 Once you’ve soaked in the (free) beauty of Red Square, you’ve gotta battle the crowds and pay the (rather reasonable) fee to get into the Kremlin. 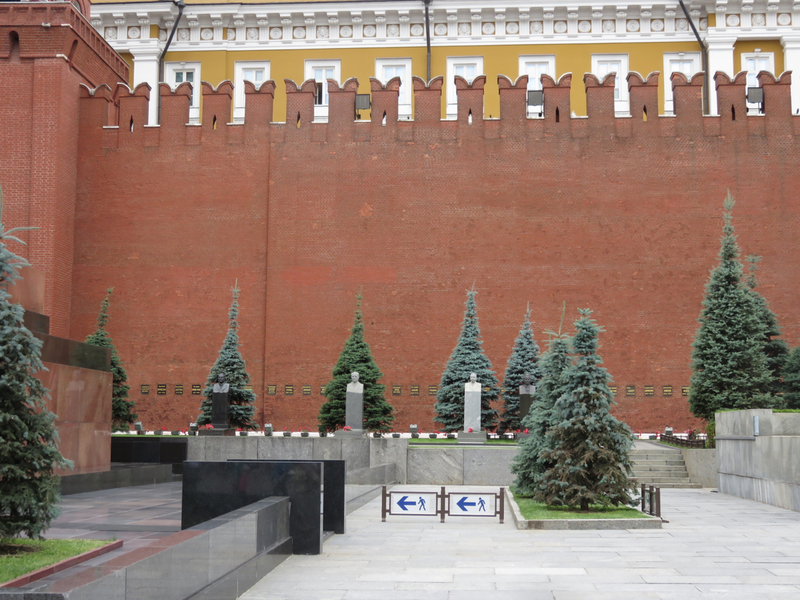 The red-walled Kremlin is a lot of things to Russia. 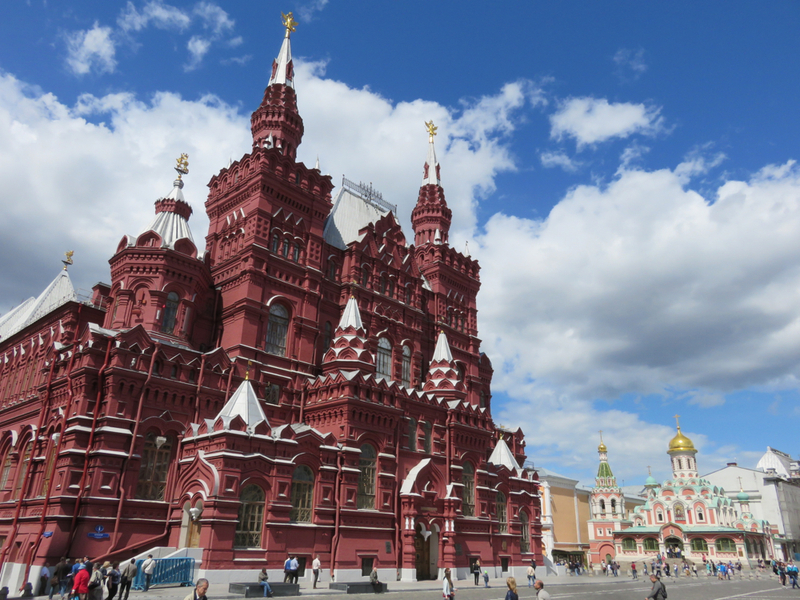 It’s it Russia’s national capital, presidential residence, historical religious epicenter, and maintains a noteworthy chunk of the country’s historic artifacts. 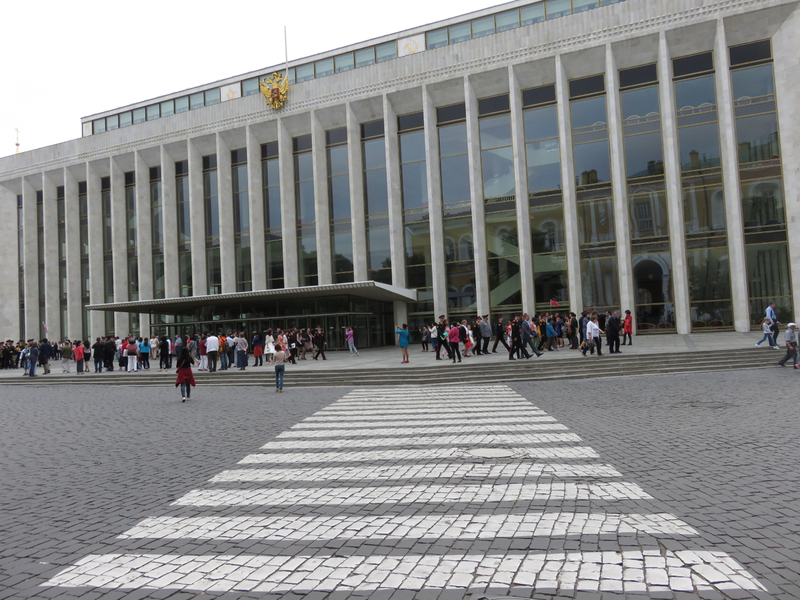 The Soviet-era Palace of Congresses, a massive building for government meetings in the Soviet days, which has since hosted performances for the likes of Mariah Carey! 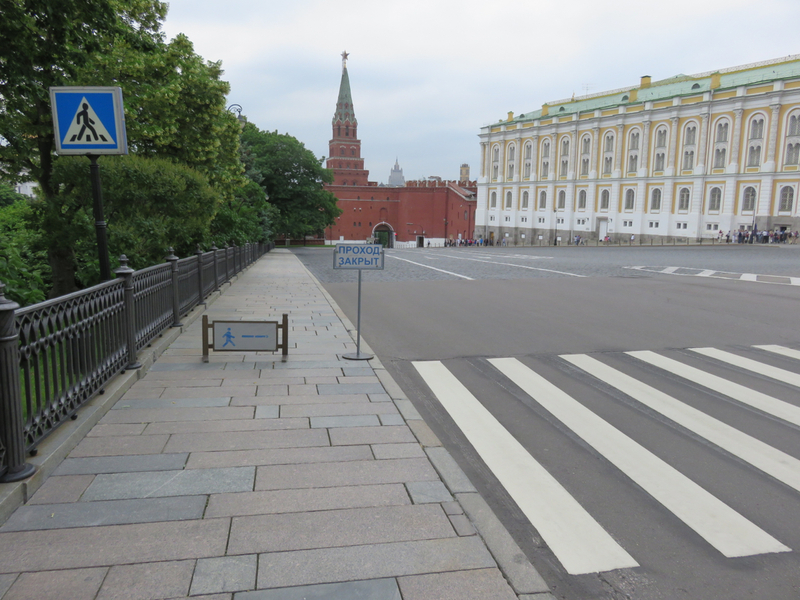 There’s definitely a clear protocol for visitors to the Kremlin. You walk exactly where they tell you to walk; step outside the boundaries, and a shrill whistle will goad you back in line. 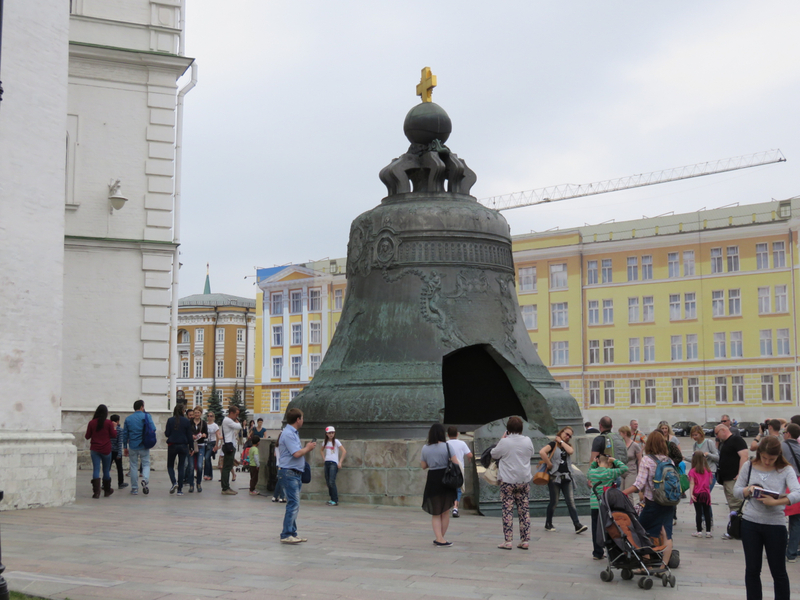 The Tsar Bell, replete with bizarre history. It’s almost 300 years old, and the largest bell in the world. It weighs about 220 tons. 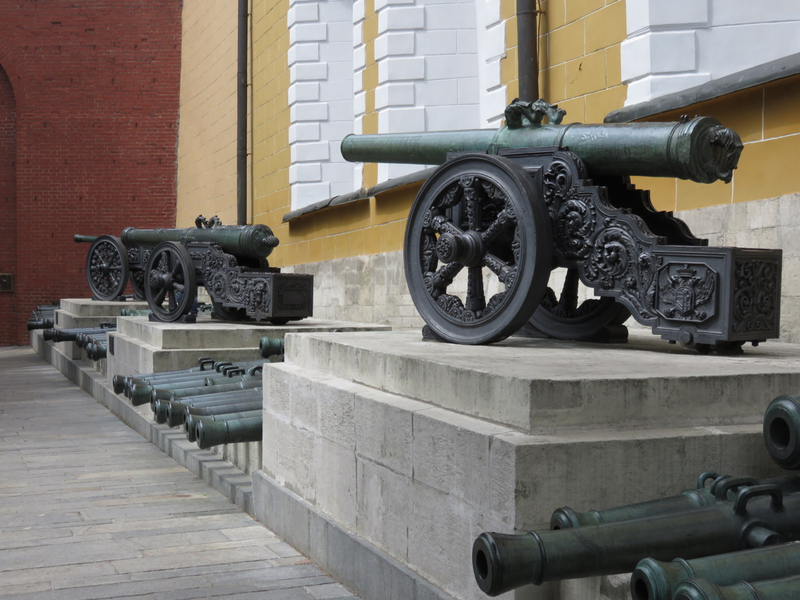 When Napoleon occupied Moscow in the early 1800s, he wanted to plunder the bell; but how in the heck would you move the bell 200 years ago?! On its original casting, the bell was threatened by fire right as it was being cooled; workers dumped water on it, causing a large piece to crack off. It was even used as a chapel at one point. 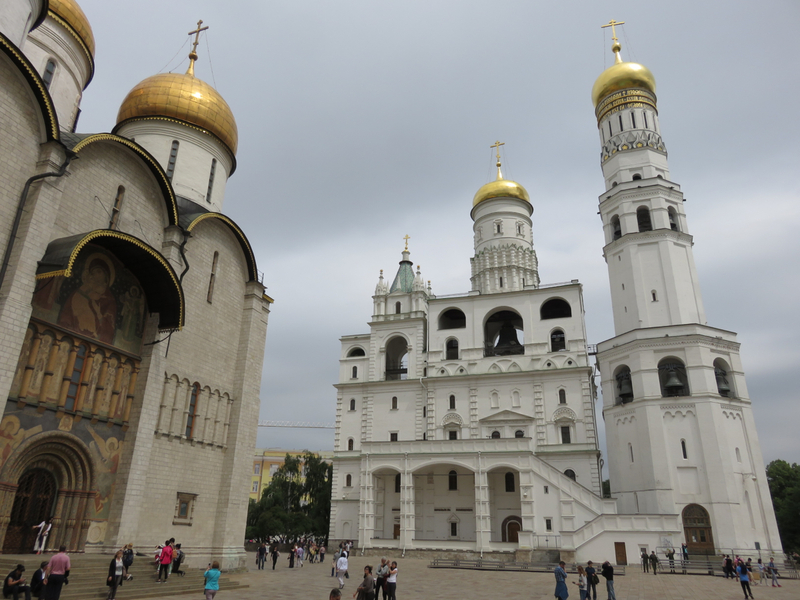 Cathedral Square is the Kremlin’s main tourist spot. 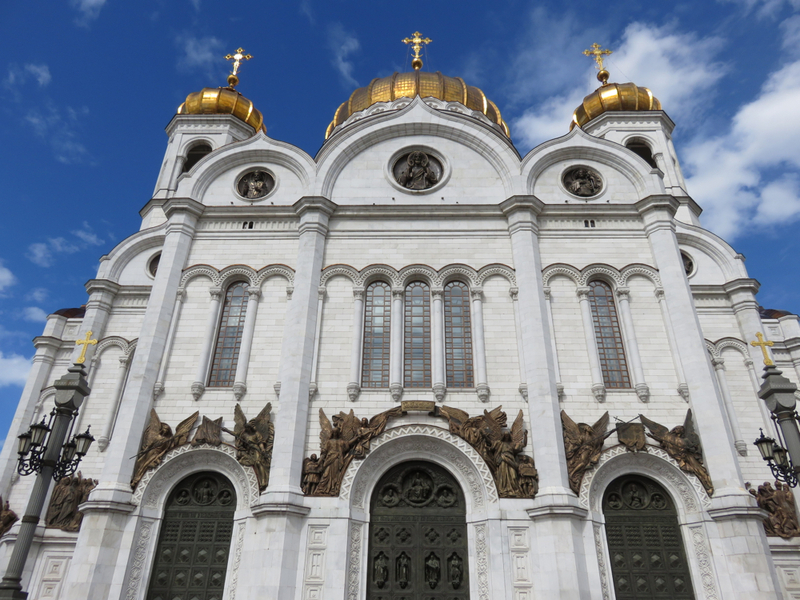 The Square hosts four major Orthodox cathedrals, each serving a distinct historical purpose: one for royal coronations, one for burials, one for prayer, and one for the storage of icons. 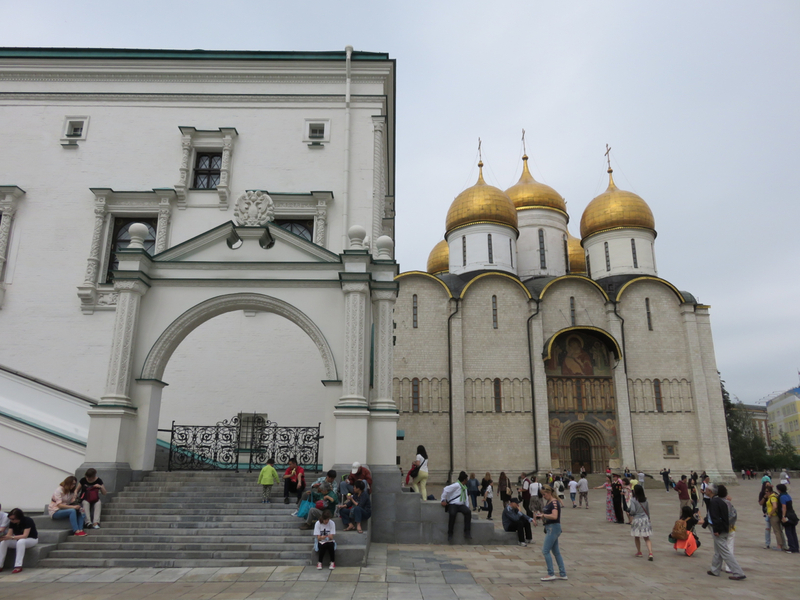 Following the dutifully-enforced Russian tradition, however, no photos are allowed inside, leaving me only with photos of the square itself. A striking place, to be sure. 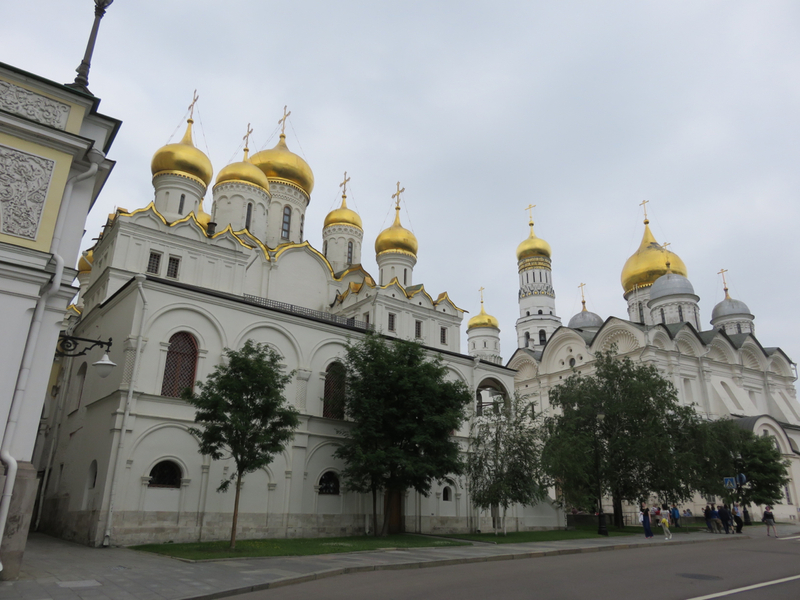 Nobody could complain for a lack of gold domes! Alas, in a manner that reminiscences Topkapi Palace, a swarm of bodies floods each church entrance like it’s a Transnistrian beehive! 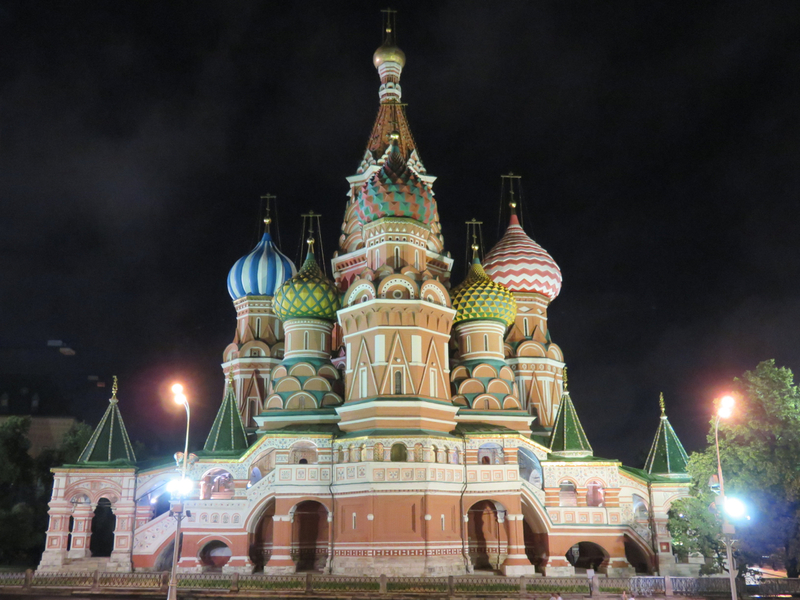 Longtime readers of this blog know I have a penchant for exploring huge cities, and a recent trend of visiting BRIC countries (Brazil, Russia, India, and China). I visited São Paulo in 2012 and Shanghai in 2013–why not try my luck with the economic powerhouse city of another BRIC country? This time, it was Russia. 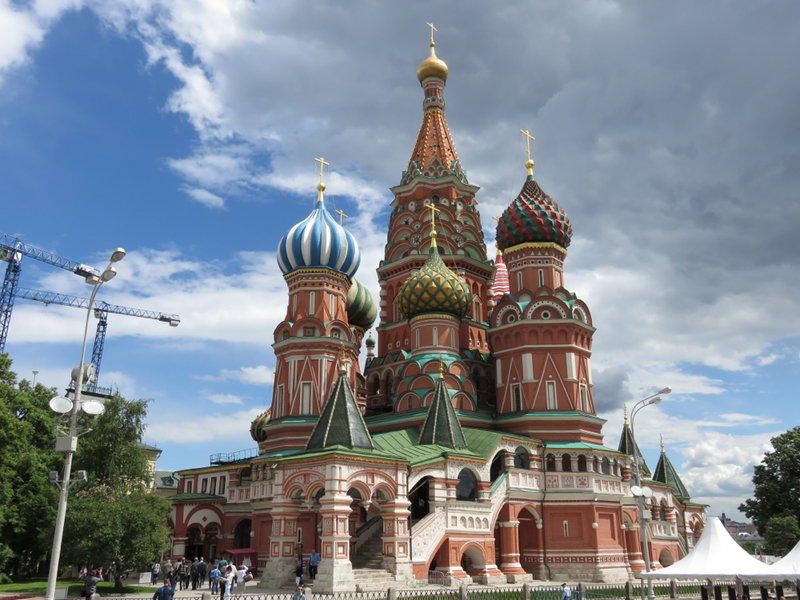 Truth be told, a big part of the reason I opted to go to Russia at all was pragmatic: airfares from Atlanta were almost $500 cheaper than other European gateways. Further, flights to other parts of Eastern Europe were dirt cheap, probably owing to the vast currency fluctuations against the dollar. All of this more than paid for the cost of a visa. I figured, why not give Russia a whirl? 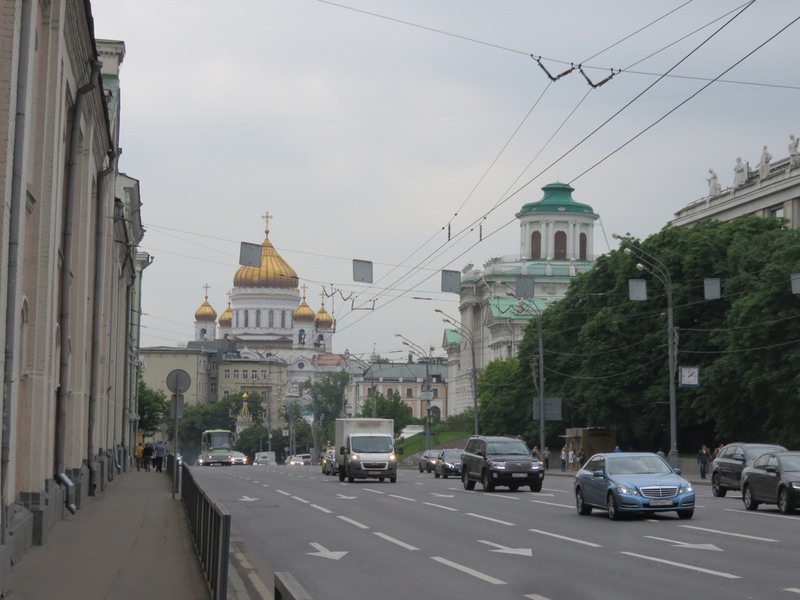 So, the big question: does the real Moscow match my mental image as an ugly, unfriendly place? Absolutely not! 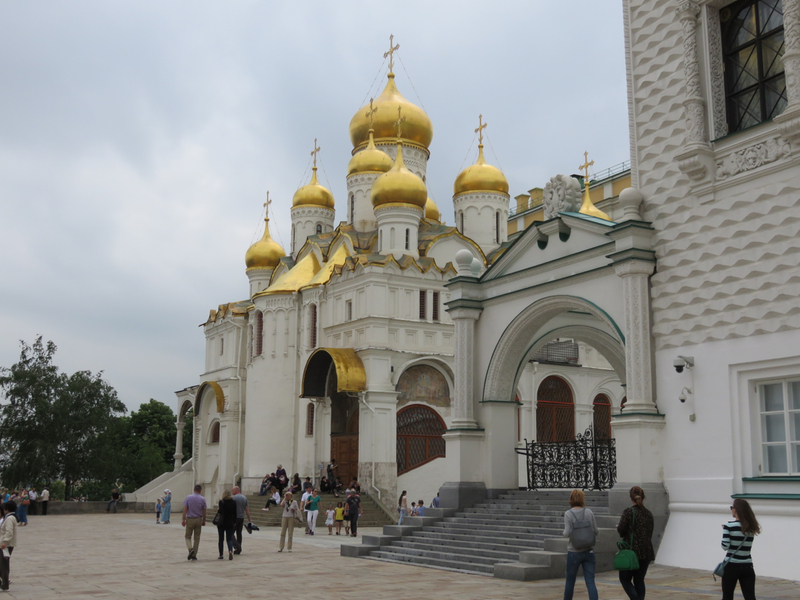 I actually found Moscow to be pretty darned pleasant, and with a whole lot more to see and do than I had expected. 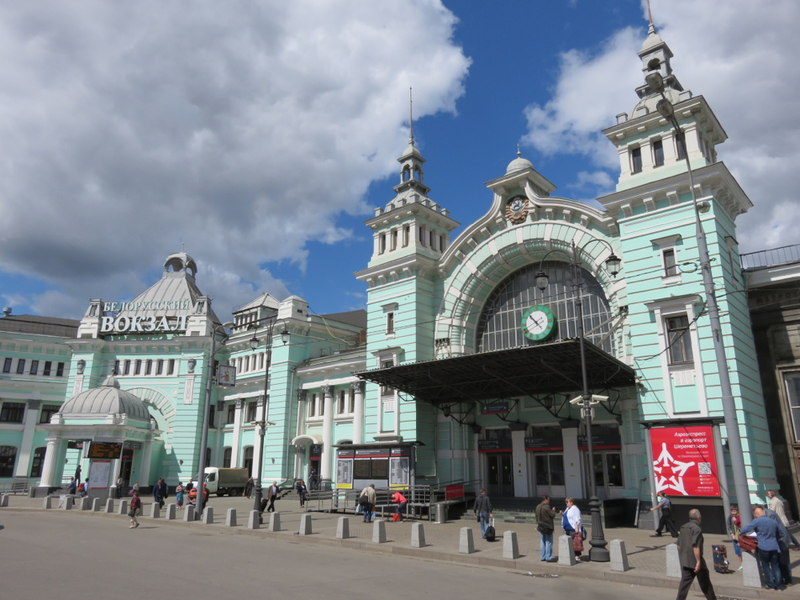 After taking Moscow’s Aeroexpress train into town, my first image of Moscow was Belorusskaya Station. Nothing drab or unfriendly about that! 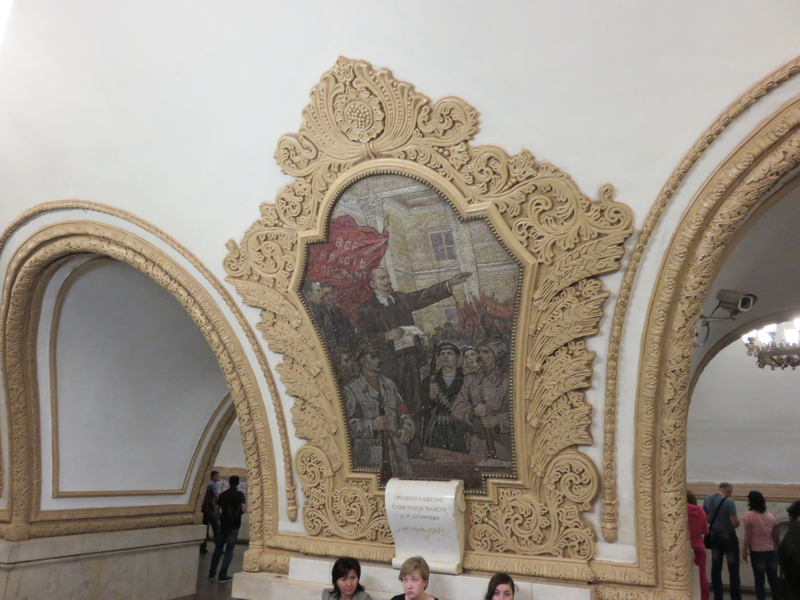 Next up, it was time for a crash course in Moscow’s metro. And what a metro it is! 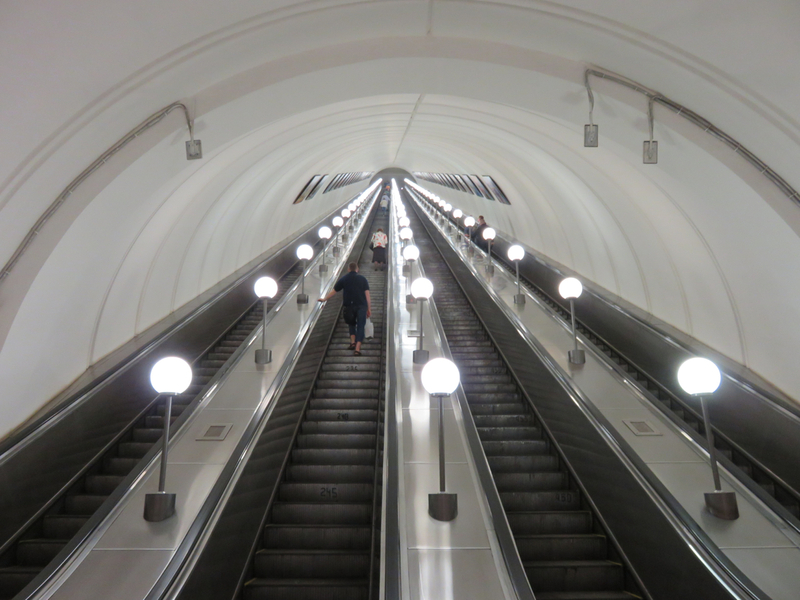 The stations are deep, deep underground, accessed by extremely fast-moving escalators that typically carry far more passengers than in this photo. 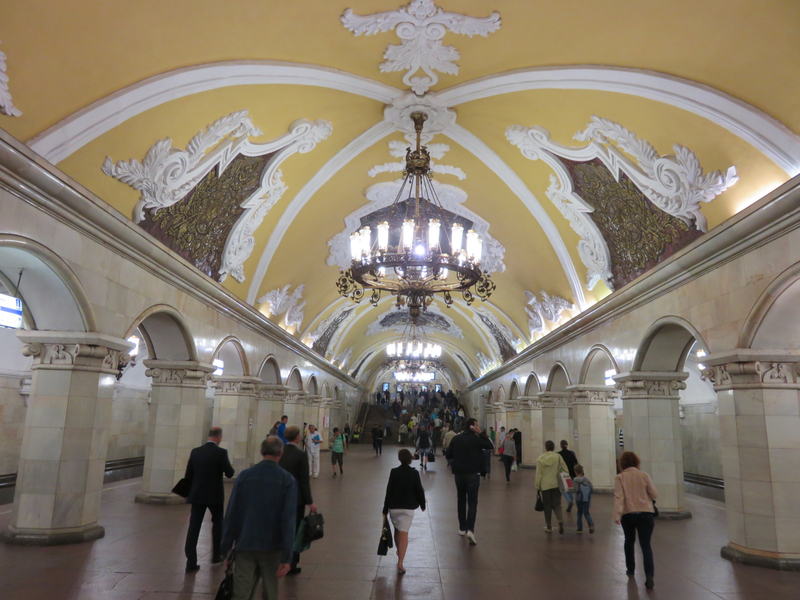 Purely Soviet-built (except for the modern extensions), the metro is literally a work of art. 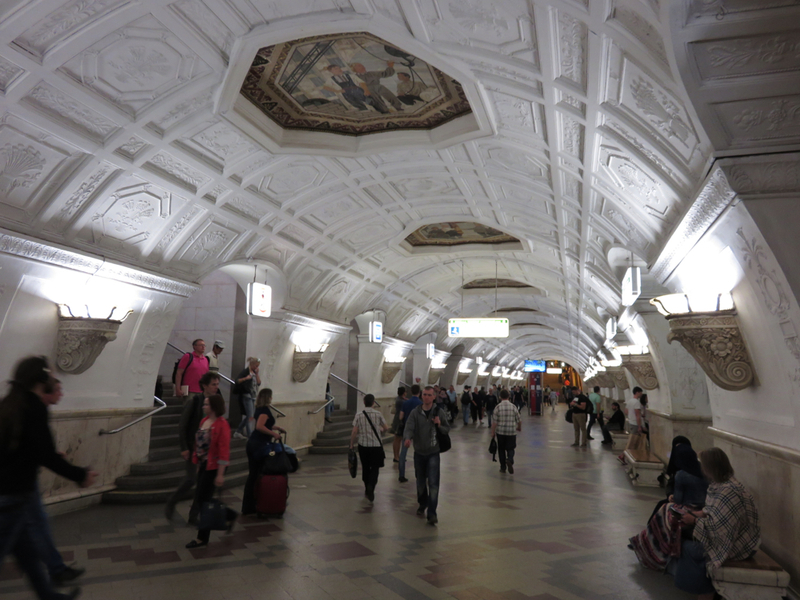 The stations blow any other metro I’ve ever seen out of the water, aesthetically. These are not exceptional stations; these are typical! That’s enough of the metro. 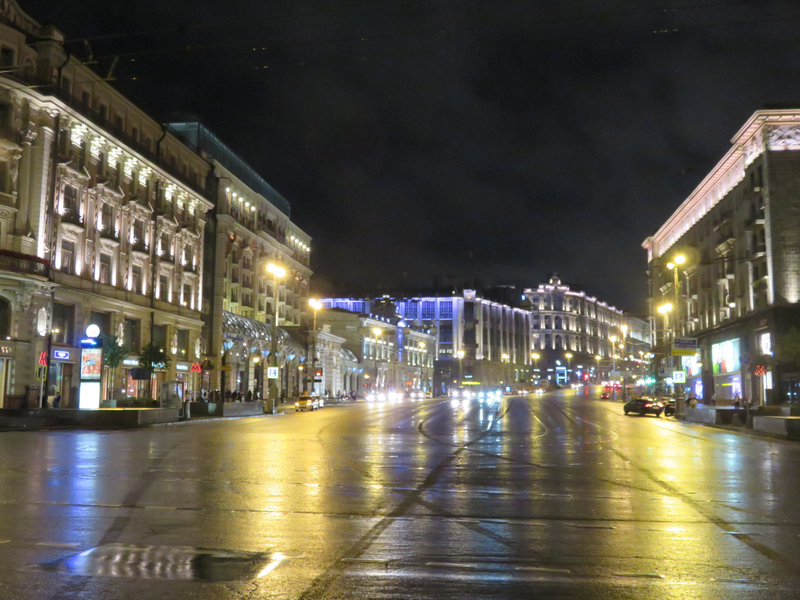 So how does Moscow fare at street level? Pretty well, actually. 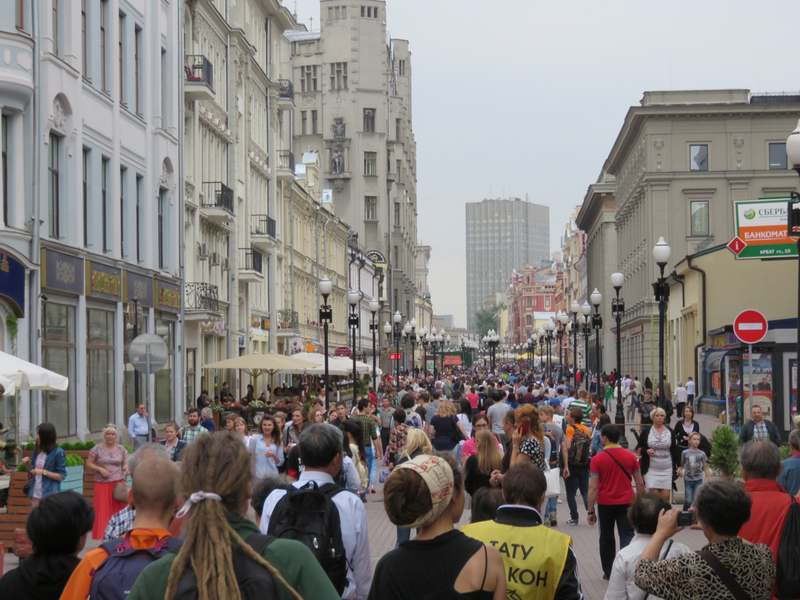 A typical central Moscow pedestrian street. Splashes of color (and a single-file line of angry motorists!). 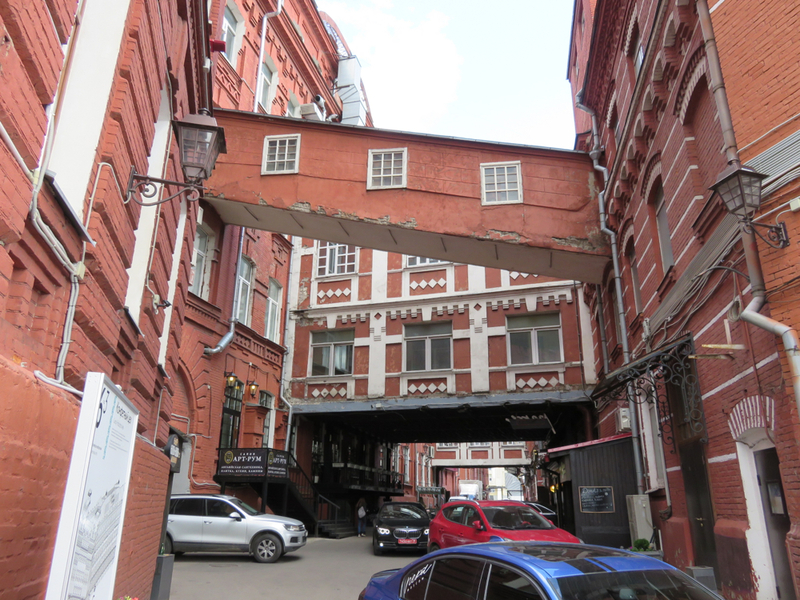 One issue with Moscow is the cars. Some big roads with lots of cars pierce the heart of the city. Motorists are generally pretty deferential to pedestrians at crosswalks, but sometimes it can involve quite a walk to get to a legitimate crossing point. Fortunately, the metro is cheap and ubiquitous. 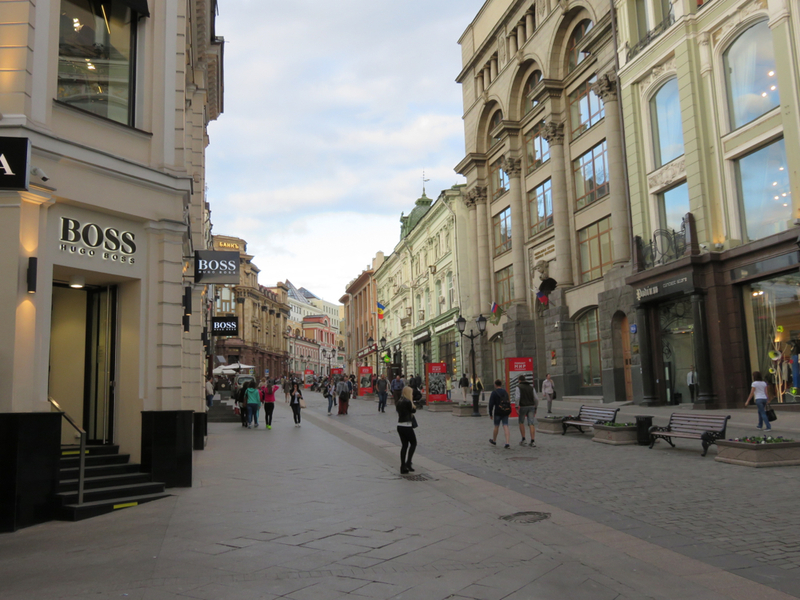 The most striking thing about Moscow, to me, was the mass of high-end shopping in the city center. It’s something to behold: expensive boutiques and luxury stores as far as the eye can see. 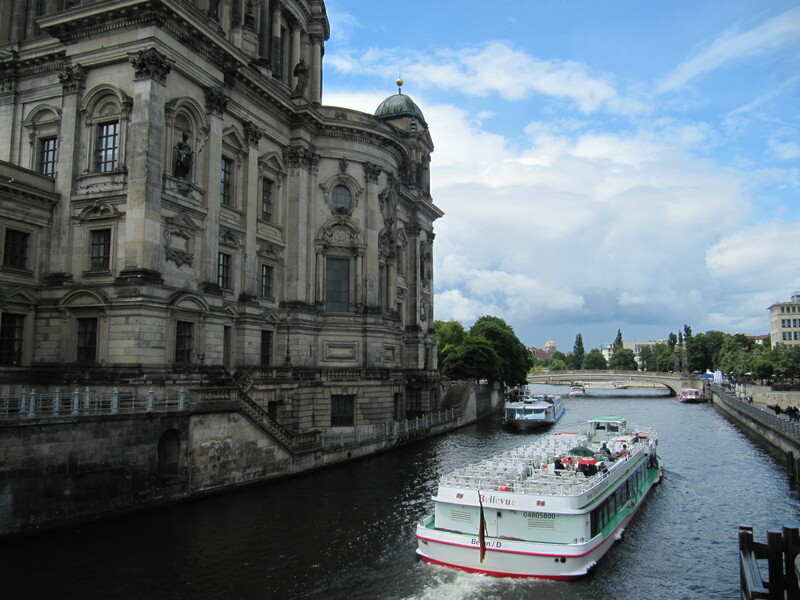 Expensive cafes, roads clogged with black Mercedes–the city has a rich, refined feel that possibly even goes beyond western capitals. Not dingy at all! 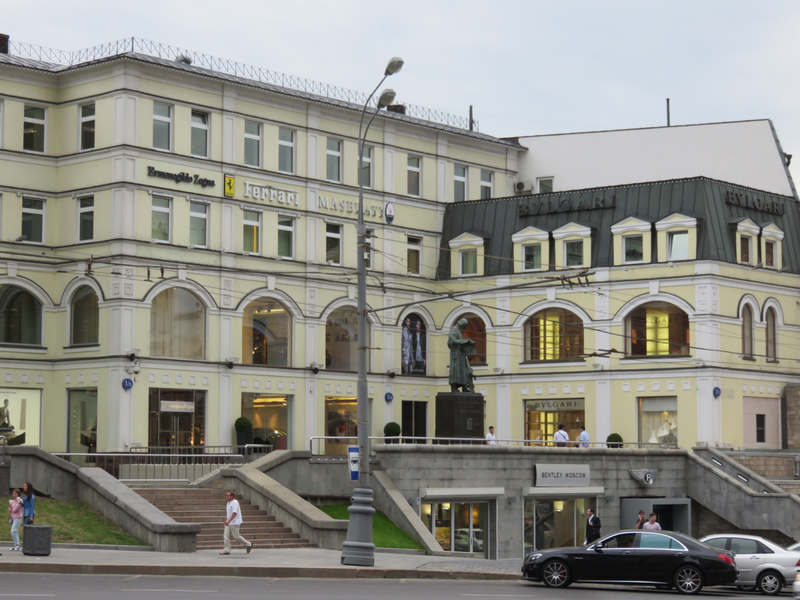 A surreal sight: communist icons adorning buildings now filled with designer stores marketed towards a razor-thin segment of Russia’s elite. High-end frills abound. 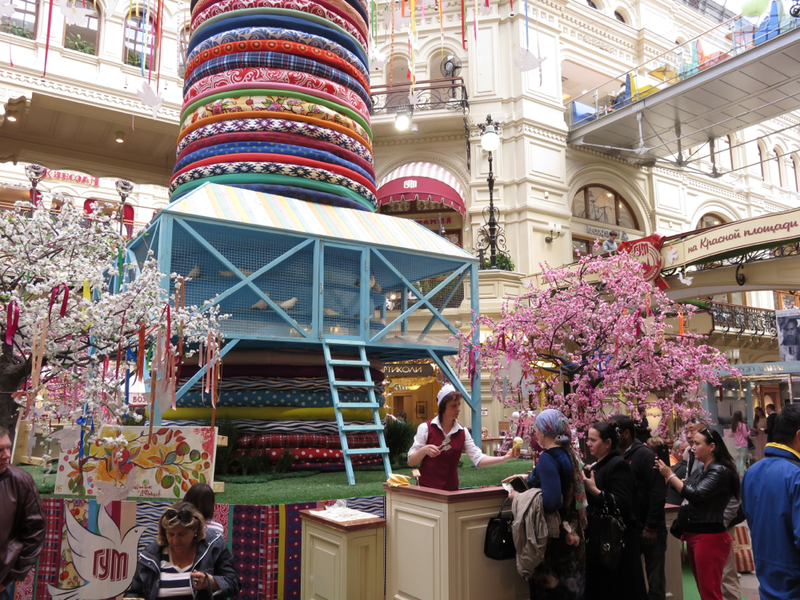 This is perhaps a contender for the world’s most elaborate ice cream stand, complete with a massive fabric totem serving no clear purpose, augmented with a large cage packed (perhaps symbolically?) 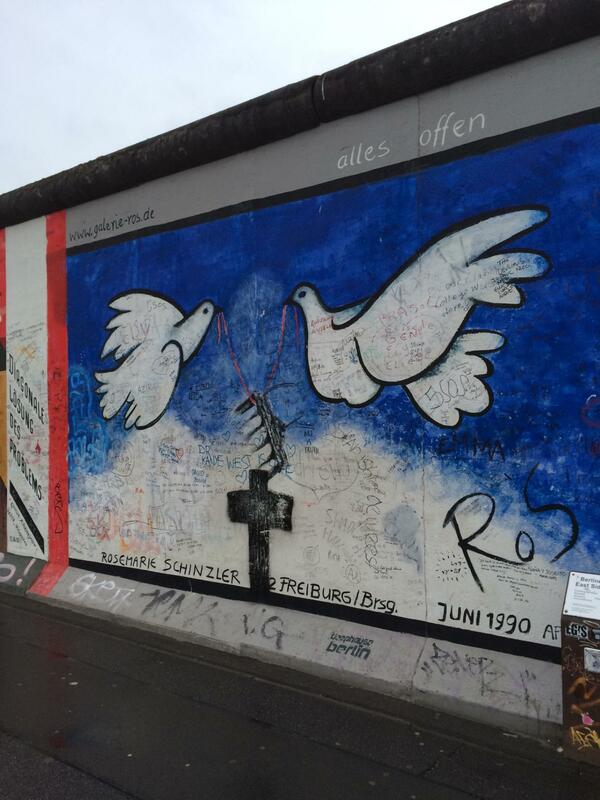 with doves–just because. A plush cafe in a hidden alcove. 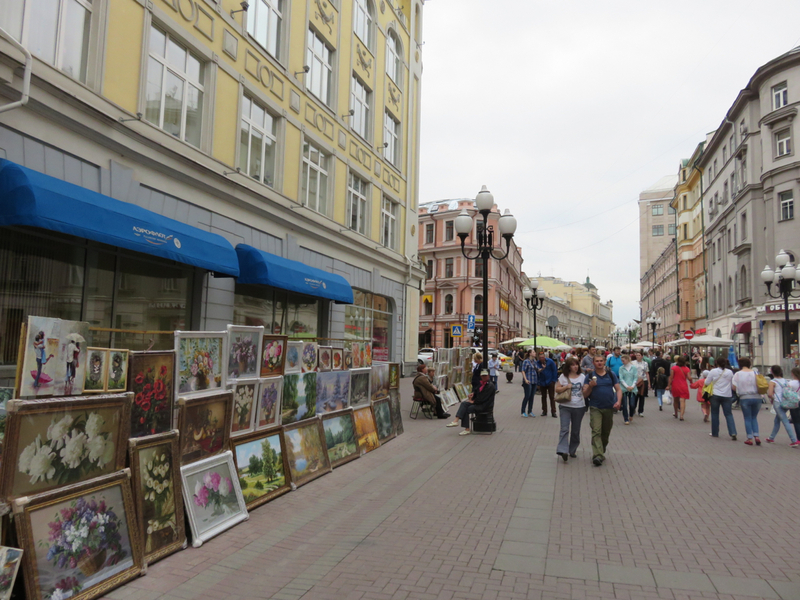 One thing is for sure: all of the same natural, handmade, organic trends you see in the US are sweeping Moscow just the same. 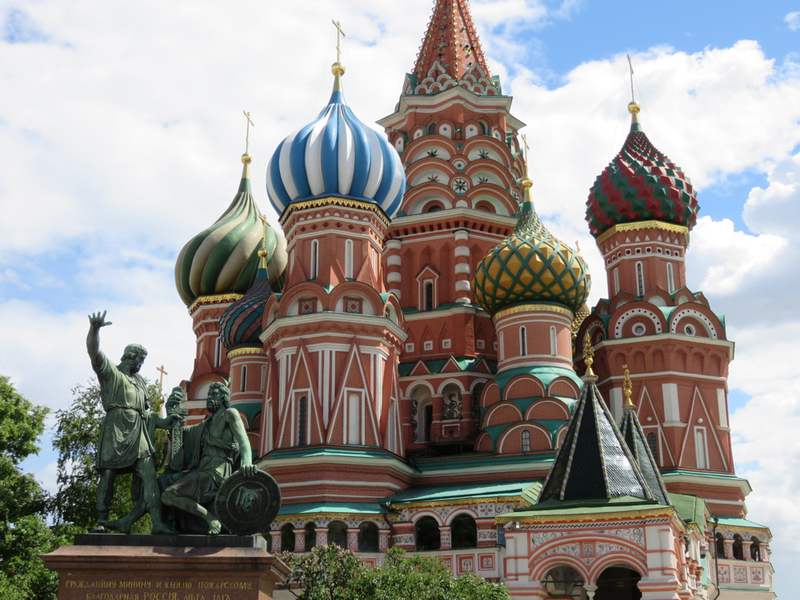 “Cold-pressed”, “local craft”, “superfood”–all of this is just as popular in Moscow as it is in Atlanta. 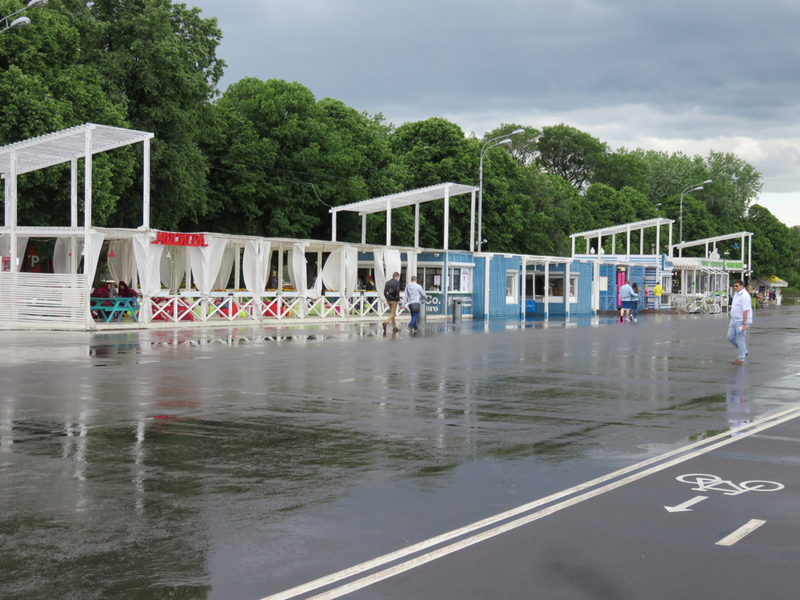 Trendy cabana-style restaurants in the park sell the same retro-chic vibe so popular in America to a youthful, bike-bound clientele. 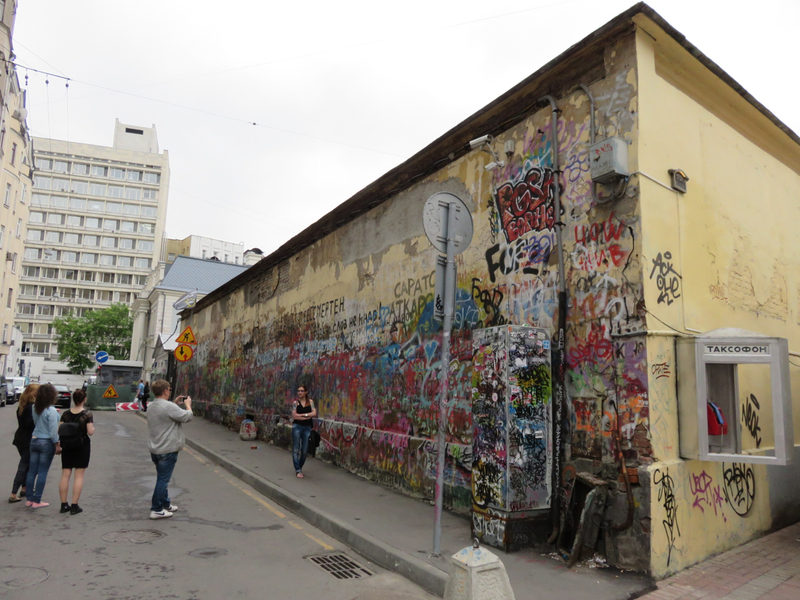 Honestly, the similarities between urban culture in Atlanta and Moscow were one of the most surprising things about the culture there. I expected a somewhat harsh, foreign, and possibly even anti-American edge to the people. Not so: many young people wear t-shirts saying New York, Brooklyn, or Los Angeles, and sometimes even with American flag patterns. 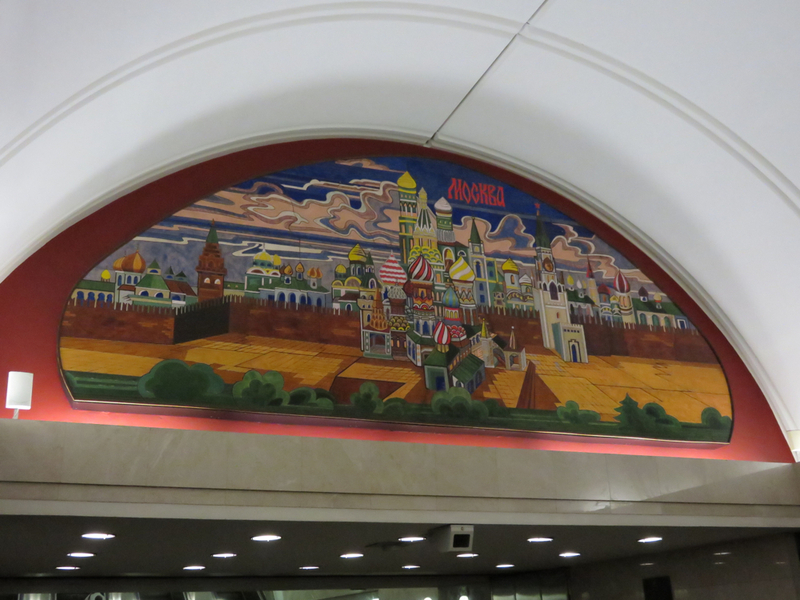 I told one Russian I was from Atlanta, and was expecting to hear, if anything, one of the city’s traditional claims to fame (Coca-Cola, the Olympics, the airport, MLK). Instead, I was surprised to hear: “Oh yes…the Walking Dead!” Nobody seemed to scoff whatsoever at the idea of me being an American; people seemed to respond a little more warmly than room temperature, actually. Definitely not what I expected. 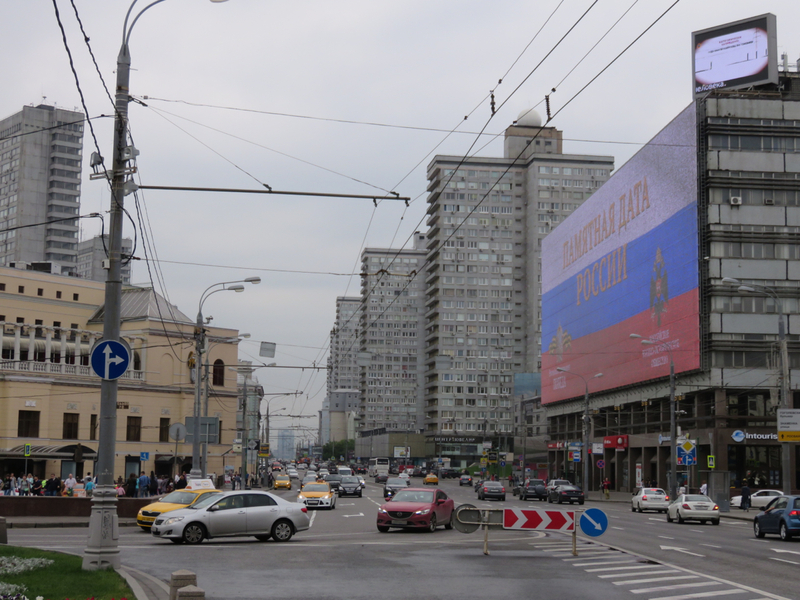 I’m sure the countryside, or even the suburbs of Moscow, could be much different, harboring the country’s reputed nationalism and xenophobia. 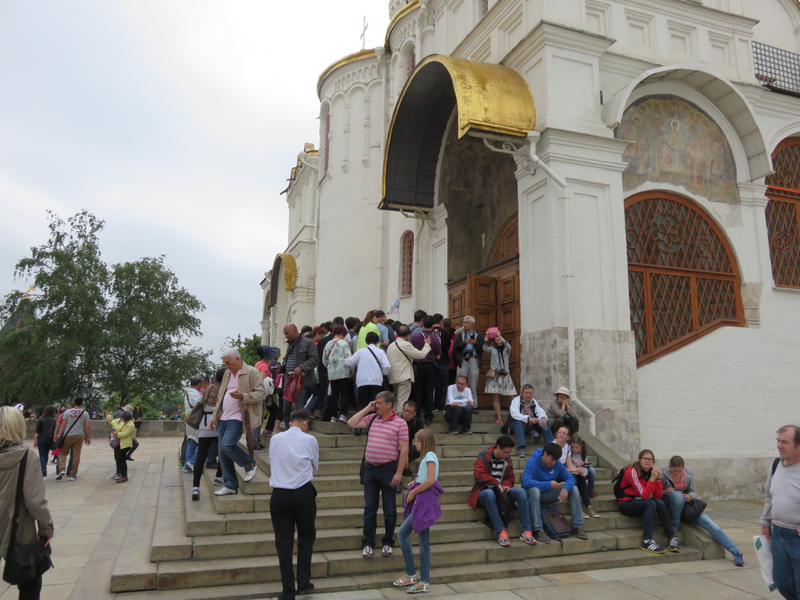 But I witnessed not a bit of it during my time in Moscow. American brands are almost as common as they are in Western European capitals (and provide helpful Cyrillic alphabet quizzes! 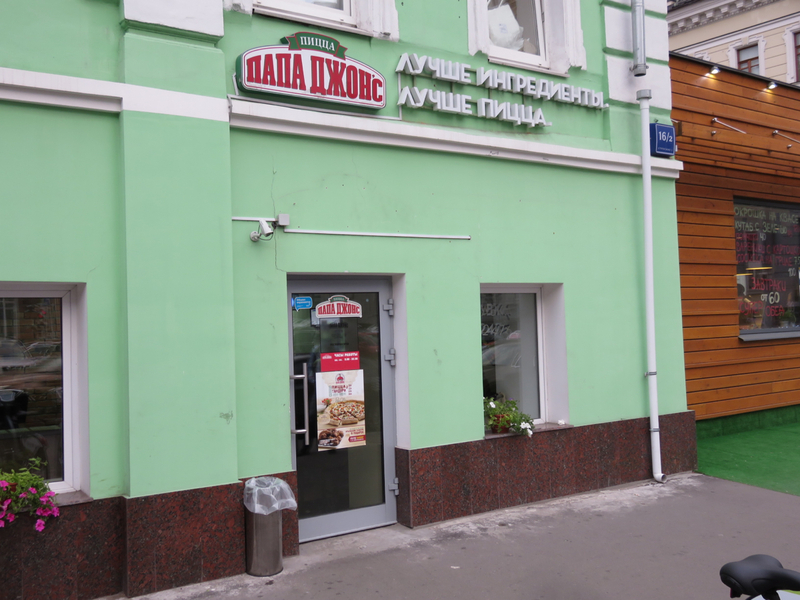 Although Cyrillic does butcher the letter “J”, translated here as “dzh”). Clearly some significant degree of investment and commercial relationship with the US remains in tact. That’s not to say all is well; clearly it is not. 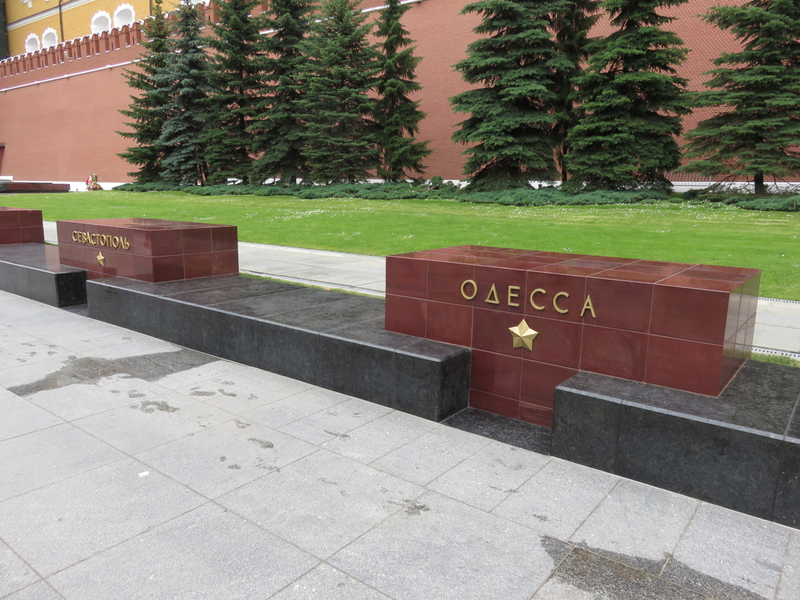 A stone’s thrown from the Kremlin, this is the recently-assassinated Boris Nemtsov’s memorial. 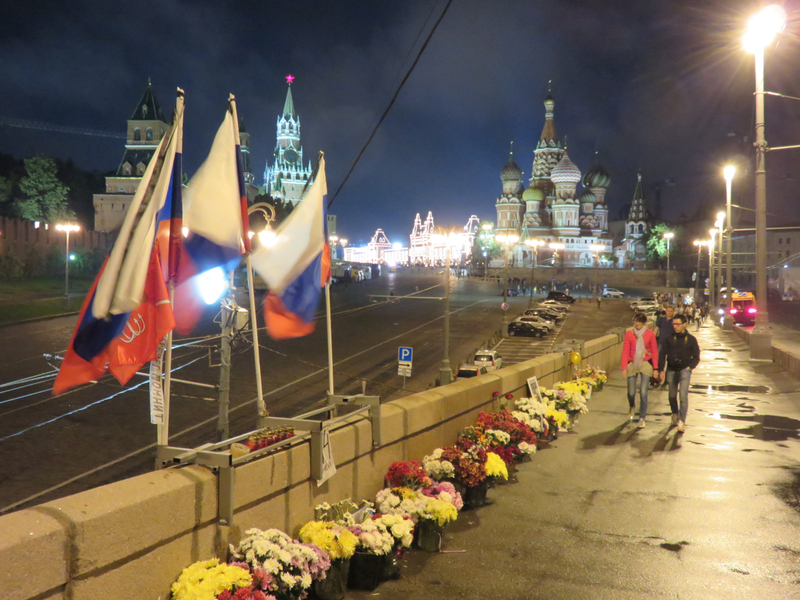 The liberal figure and Putin-critic was shot in the back four times as he crossed this bridge on February 27, 2015. 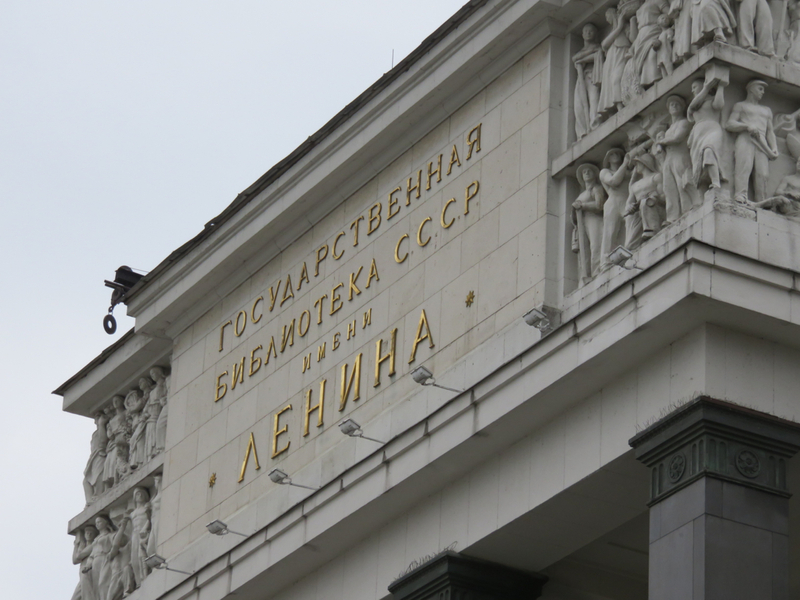 The case remains embroiled in controversy and doubt. A very sad event and unnerving spot indeed. 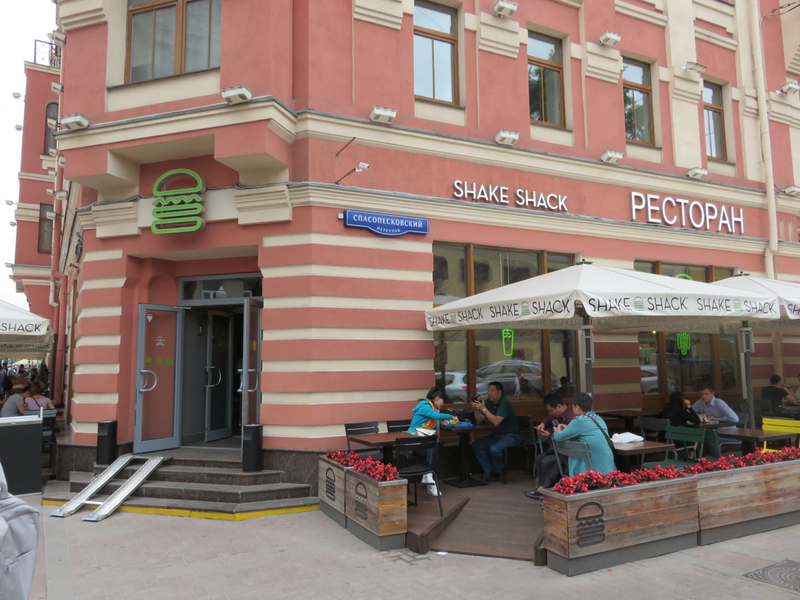 Moscow does live up to its reputation handily in at least one respect: being expensive. Even with the marked devaluation in the currency of late, these prices are exorbitant. 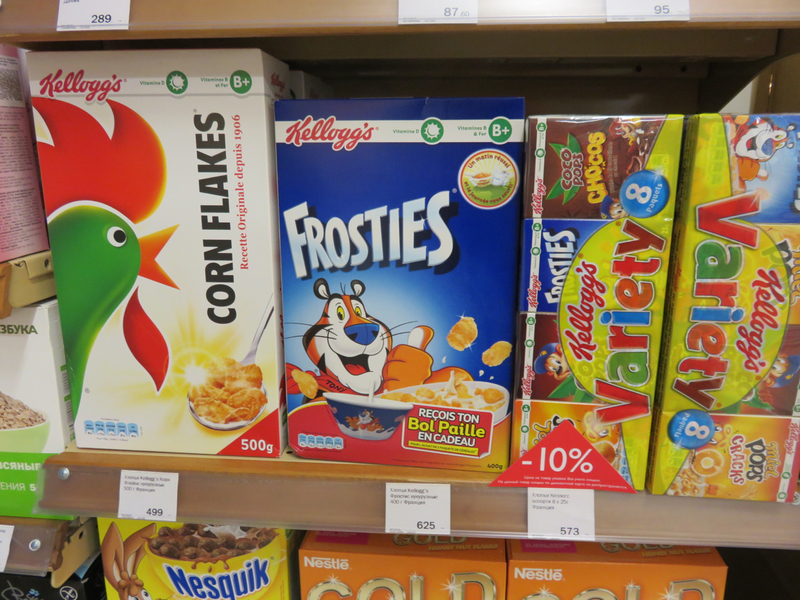 625 rubles for a box of cereal? That’s $12.50. Yikes. 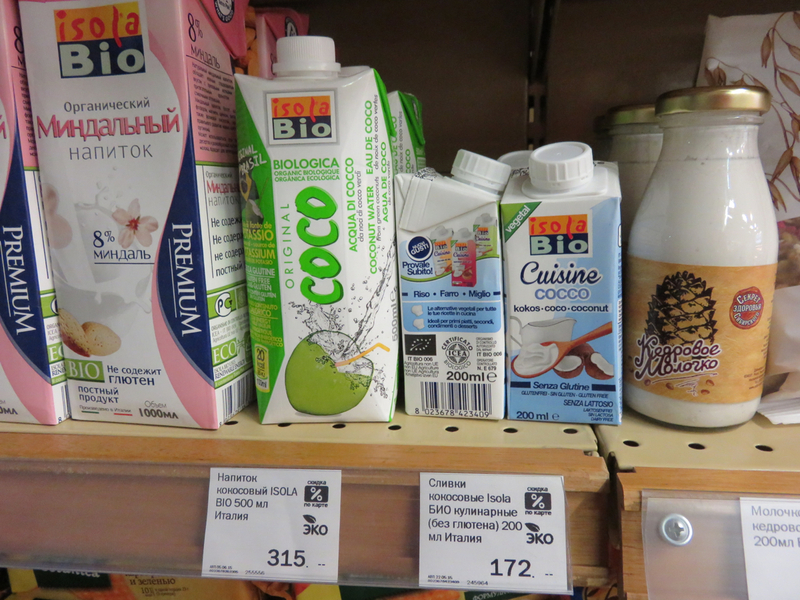 $6 for a coconut water would sure have me rethink my health drink fads! 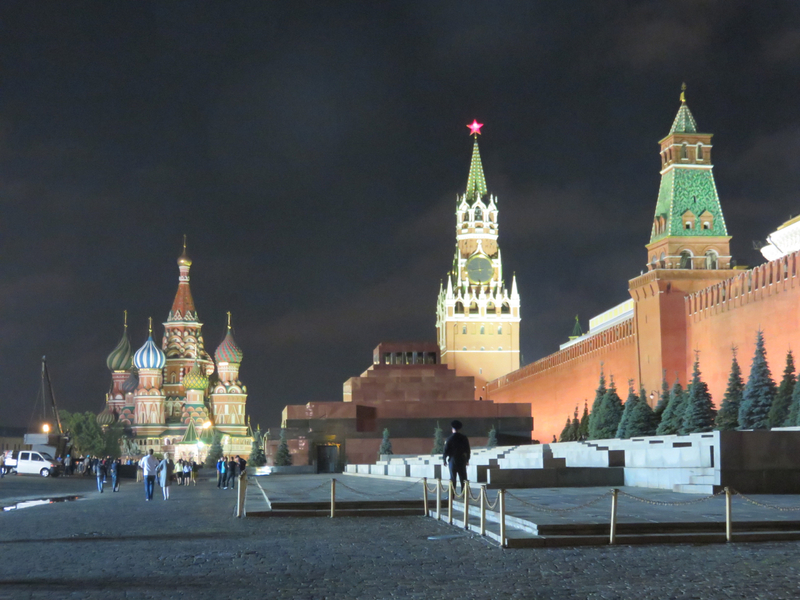 Next up: Red Square and the Kremlin!